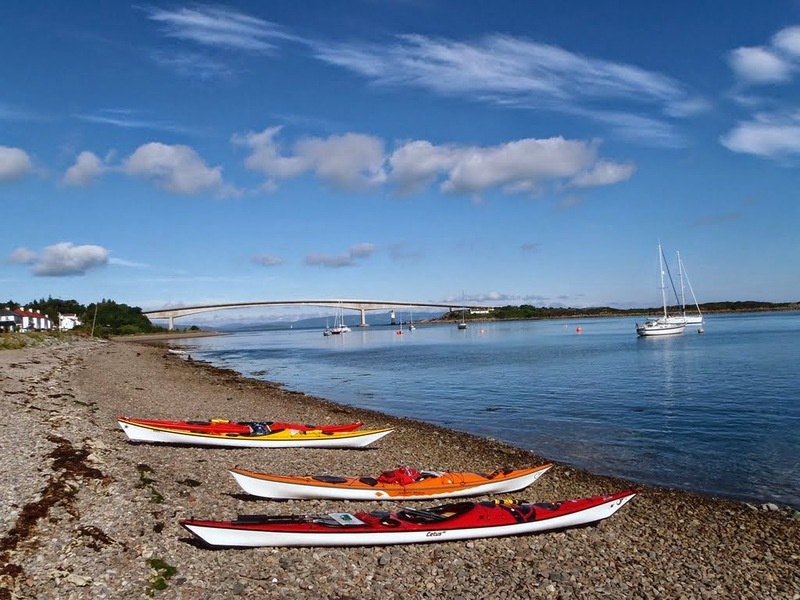 Surfers Against Sewage in conjunction with the Skye Beach Clean Boat are having a beach clean at Ardtrek Point on Saturday 23 March from 12.00 midday to 3.00 pm (see their facebook pages, also posted in Skye Marine Matters). There is another beach clean planned for Talisker Bay on 30 March, 11.00 am to 3.00 pm. Brian Wilson, Kayaker and Author. Brian Wilson is a highly respected author in the kayaking world and his books "Dances With Waves" and "Around Ireland By Kayak" have been enjoyed by many. 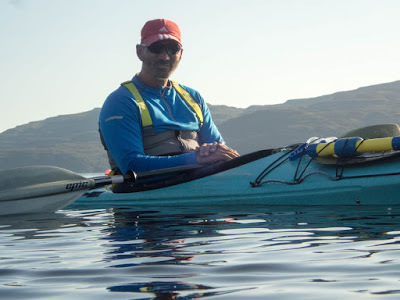 He is the speaker at the "Skye Reading Room", Tuesday 26th February 7.30pm at Edinbane Community Hall - Brian Wilson - travel author, environmentalist and kayaker. Brian will talk about his work and if you get a chance to read either of his books beforehand he'd be happy to discuss any related themes and issues. 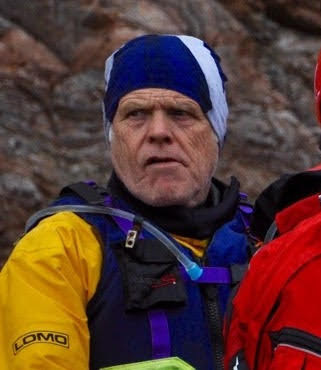 A new edition of 'Blazing Paddles - A Scottish Coastal Odyssey' will be available in the next few months but copies of the older edition may be bought direct from Brian by post if you'd like to read it before his talk. Just email your address to him brinkstone55@gmail.com. 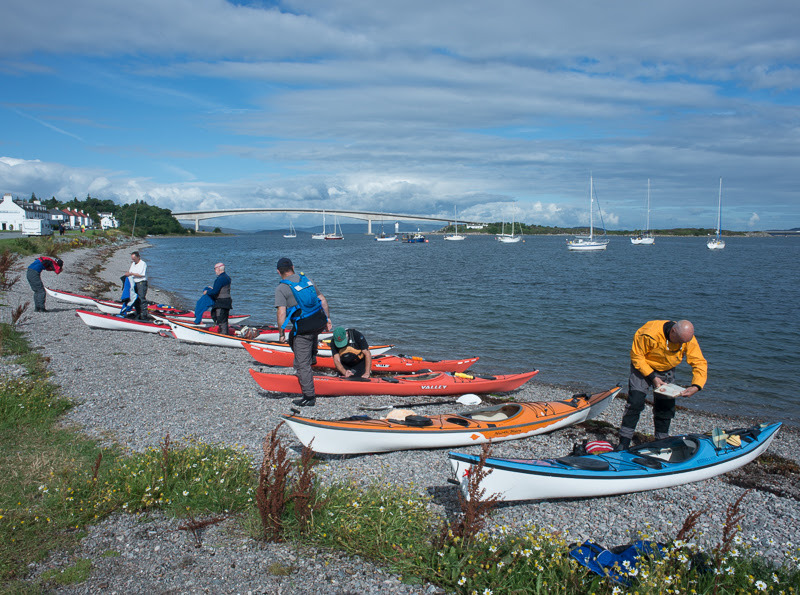 Dances with Waves - Around Ireland by Kayak' may be available in the library or online. 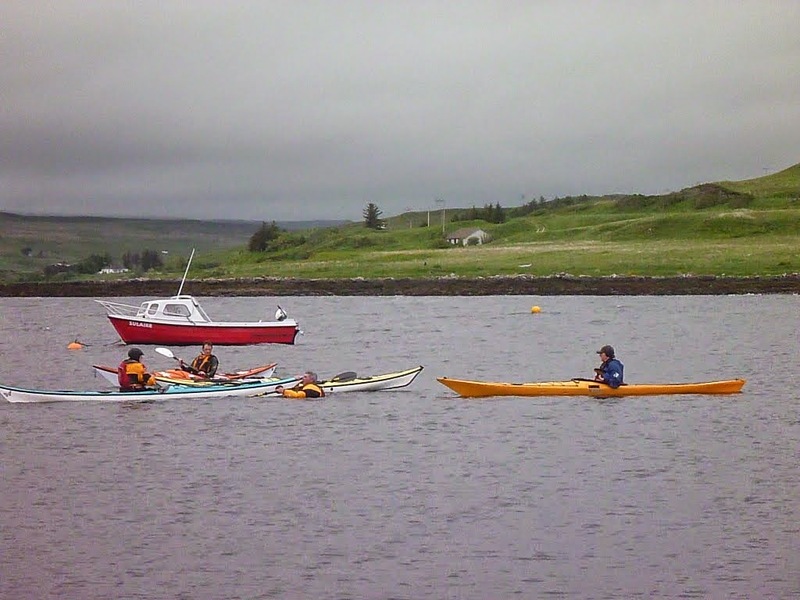 The North Skye Kayak Club's A.G.M. will take place at 7.30pm on 28th February 2019 at the Tongadale Hotel, Wentworth Street, Potree in the resident's lounge. Plans are being made for kayak pool sessions during January, February and March and members will receive details of times and cost of sessions via email. Its a good chance to learn/practice rolling and other skills in a warm environment. Club members will be very pleased to hear that Will has passed his Sea Kayak Leader qualification. Very well deserved! Camustianavaig to Rassay and Back, 1st September 2018. Click on the photo to see all the trip photos that were taken by Ross. Mystery Tour Sunday 19th August 2018. There is a club trip (mystery tour) of about 15 km suitable for all levels this Sunday from Caroy jetty, meeting at 10.00 hours, on the water for 10.30 hours under Alan’s leadership. Could an members planning on attending contact Will and Beverly by email / phone if they wish to attend. Alan and Ross will be in attendance. Please bring the usual food, drink, spare clothing and any meds you require. An Evening Session June 2018. Click on the photo to see all the photos. We are planning to start our evening sessions on Tuesday 15th May 2018. Details of these sessions will be emailed to paid up members. Any new members who do not have their own kayak or equipment may loan club equipment for a small fee.It would be an advantage if new members invest in roof bars and straps to aid transportation, they will come in useful when they buy their own kayak. Staffin to Duntulm 14th April 2018. Click on the photo to see all the photos of the trip. 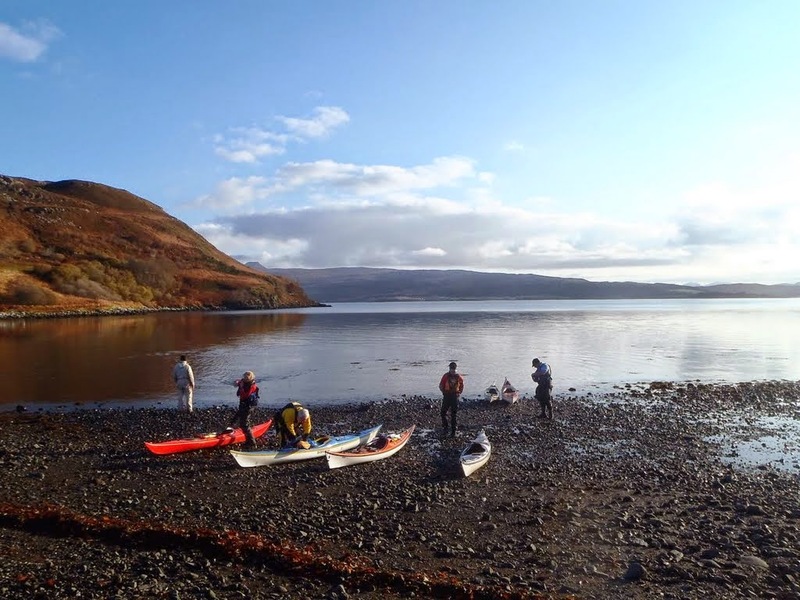 CLUB PADDLE SUNDAY 1ST APRIL 2018 - LOCH POOLTEIL (Meanish Slip) to LOCH BRACADALE (Camas Ban) 30km. CLUB PADDLE SUNDAY 4th MARCH 2018. I am intending to lead another (short'ish) club paddle this Sunday, distance roughly 20 km's. My intentions are to meet at the Three Chimney's slip for 09.00. Once on the water we will head across to the Dunvegan side and make our way up towards the Coral Beach then onto Isay Island where we will possibly stop for a break before heading back to the Three Chimney's slip, looking to be off the water by 1.30ish. Forecast for Sunday is roughly Easterly F4. This trip is open to all as long as you are happy with the distance and weather conditions on the day. If unsure of your suitability for this trip please do not hesitate to contact me to discuss. If you would like to come along please contact me at shamus_cornes@yahoo.co.uk please do not turn up unannounced. As always please ensure that you bring with you a spare change of dry clothes, a hot drink, snack/lunch and any personal medication that you may require. CLUB PADDLE SUNDAY 25th FEB. I am intending to run a (short'ish) club paddle this Sunday roughly 20km. My intentions are to meet at Caroy Slip for 10.30. Once on the water I would then like to head up the coast towards Ornsay where we will decide on whether to go out and around Wiay or head back into Loch Bracadale. Forecasts for Sunday are roughly; SSE F 4/5 with bright Sunshine. There should hopefully be some residual swell left from the previous day's blow which we could take advantage of to have a bit of fun in the Sun for those who are that way inclined. This trip is possibly more suited to 3* paddlers and above or paddlers who will be comfortable in the forecasted conditions. If you would like to attend please in the first instance contact me at shamus_cornes@yahoo.co.uk please do not just turn up on the day. As always please ensure that you bring with you a spare change of warm clothes, a hot drink/snack and any medication that you may require. It is forecasted bright sunshine but with a air temperature of 5ºC please dress warmly. AGM AT THE TONGADALE HOTEL, 22ND FEBRUARY 2018. Our Club AGM this year will be on Thursday, 22nd February at 7.30 pm in the first floor Residents’ Lounge  within the Tongadale Hotel, Wentworth Street, Portree to which you are cordially invited. Committee Members are asked to attend a brief pre-AGM meeting at 7 pm. If you have any business you wish to be discussed then please email me by return. Any Nominations for Election to the Committee should be made before the meeting. As well as being an occasion to attend to the year's business this is also an opportunity to have a chat about Club activities in general. Coffee and drinks are available at the bar and please feel free to bring along a snack to share should you wish a nibble. 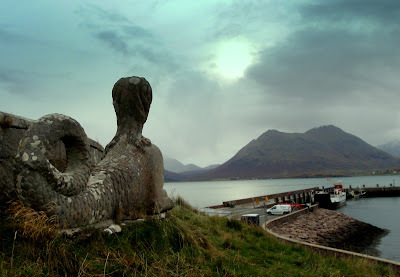 SUNDAY 4 FEBRUARY STRUAN TO TALISKER BAY AND RETURN. The forecast is for light breeze, sunshine and slight swell. Please let Ross and Alan know if you are coming along. Congratulations to Ross as he is now a ‘British Canoeing Sea Kayak Leader’ having passed his assessment last weekend in what sounded to me like very challenging conditions. 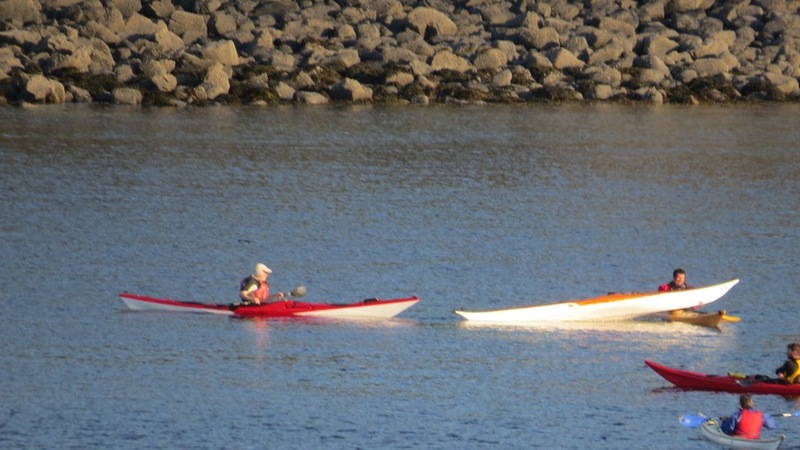 The Club now has three sea kayak leaders. Who will be number four...? note ‘British Canoeing Sea Kayak Leader’ has replaced the 4* leader award. CLUB PADDLE SUNDAY 7th January 2018. If you are intending to come along please ensure that you bring a spare change of clothes, a hot drink, snack and any medication that you may require. Please let me know if you are intending to come along. Hope to see some of you there......James. It’s winter and that means kayak pool sessions. 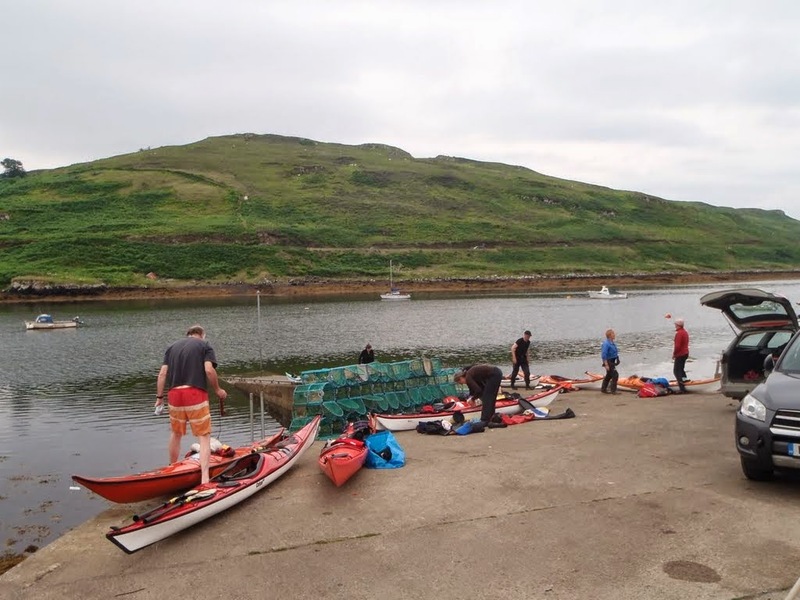 All paid up club members will have received details of the arrangements that have been made for the kayak pool sessions at Portree and how to book and make payments. The sessions are during January, February and March 2018. It’s an ideal time to learn or practice kayaking skills, like rolling and self rescues in a warm and safe environment and be prepared for the sea. Be sure that you book your place as numbers are limited and you cannot just turn up and expect to go into the pool! 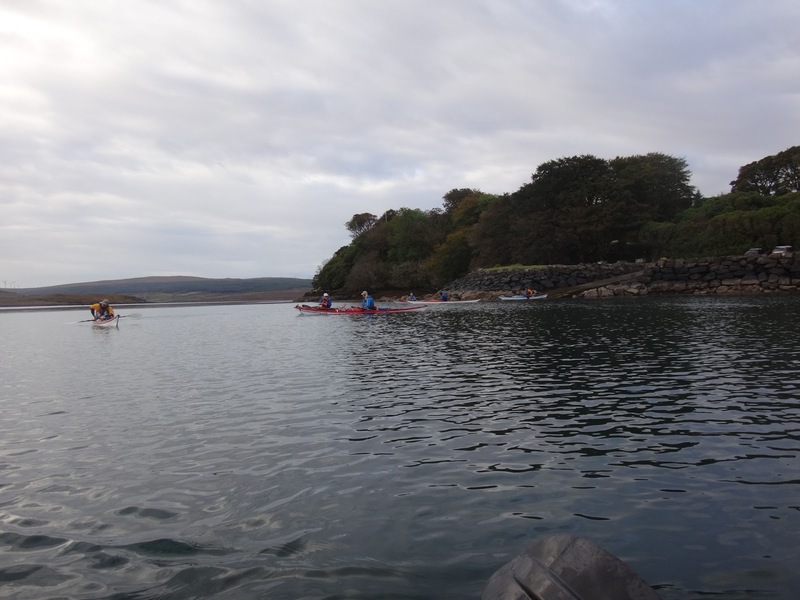 PADDLE AT DUNVEGAN 5TH NOVEMBER 2017. I am proposing to lead a club trip this Sunday 5th. It will be a sheltered short'ish few hours on the water suitable to most club paddlers. The venue will be Loch Dunvegan. I would like to meet at the lay-by opposite the Three Chimney's restaurant for 09.30, we should be clear of the water by early afternoon. If you are intending to come along please let me know. Please bring with you a change of clothes, lunch, hot drink and any medication that you may require. If you are unsure of your ability to attend then please contact me to discuss at shamus_cornes@yahoo.co.uk please do not turn up unannounced. Beach Clean up at Harlosh. Will, Beverley and myself could not make it down to Ord today for the Boreraig Beach Clean but we were out on Bracadale for a short time and stopped off at Harlosh Beach to do some plastic harvesting of our own, removed the blue plastic five gallon drum that has been on the rocky foreshore for an age amongst other plastic items followed with a few bags from Camas Ban shore which when you look up close is shockingly saturated with small pieces of plastic, maybe a NSKC Camas Ban Beach Clean should be considered ? 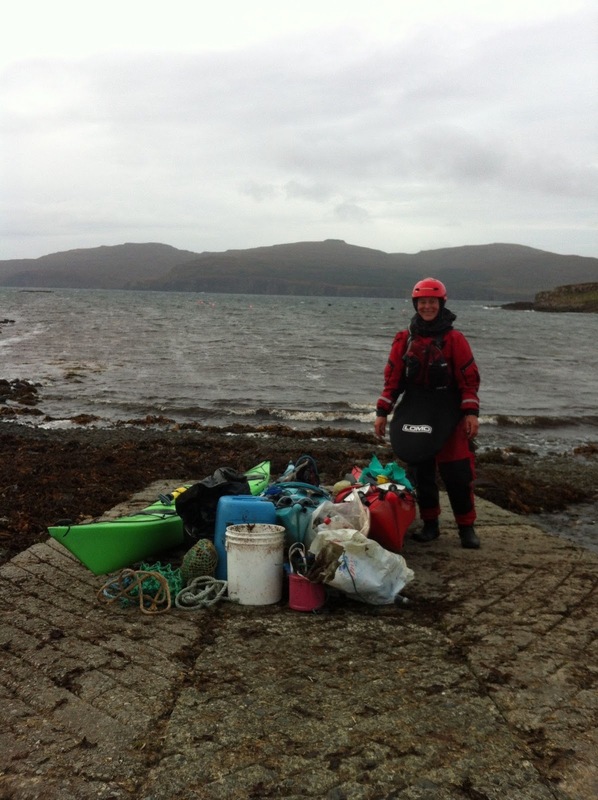 BEACH CLEAN AT BORERAIG 14th OCTOBER 2017. Check your email for the details of a beach clean that has been organised to take place at Boreraig. The launching point is Ord, meeting at 10.00. Please share transport or shuttle as parking at Ord is limited and there have issues in the past. IMPORTANT CHANGES TO COAST GUARD V.H.F. RADIO CHANNELS. LOCH BRACADALE RAMBLE SUNDAY 20 AUGUST 2017. Assuming the forecast stays good I am proposing to lead a Club trip on Sunday. I have called it a ramble so that depending on who turns up we can be flexible. However, the likely paddle would be Wiay and/or Macleods Maidens. Please bring spare clothes, food, drink and any necessary medication thatyou may be taking at the moment. Uags, Applecross 12/13 August 2017. Photos from Janice. Click on the above to see more. Photos from Jane, click on the above to see more. Photos from Ross, click above to see more. Evening Session 8th August 2017. 7pm at Struan Jetty , Struan. 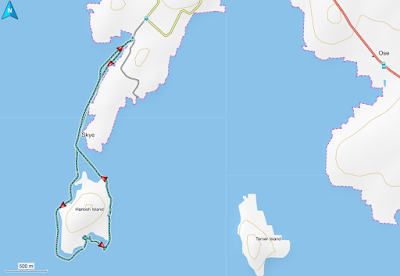 We could paddle up to Ullinish Point and possibly pass through the gap (HW 19:44 Sp) and around the outside of Oronsay and back to Struan, roughly 10km. "Rock hopping is a fun activity in itself, although when you participate as a normal part of your sea kayaking, the benefits are huge. From timing to edging under pressure and from reading the water to rescues in double quick time, all these skills are developed and honed. 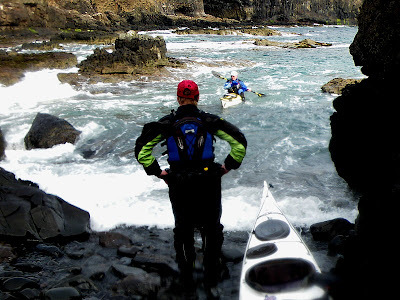 This is a great way to improve your whole repertoire of skills required in a sea kayak." Sea Kayak - Gordon Brown. And, how best to deal with the consquences if it all goes wrong. There is no way we could cover all of the above in any detail in one session and the skills will need to be practised, so envisage this could be an ongoing session when time and conditions allow for those who would be interested. Your going to have to have a certain initial skill level to progress with this. A good understanding and deployment of the key strokes is a must, the ability to roll would definitely be beneficial but not a necessity, and most importantly, a “willingness” to learn how best to utilise these skills in sometimes dynamic conditions, this will be in your best interests! This will not be for everybody but there is a lot that can be learned and a lot of fun can be had. If anyone out there is interested please contact me at shamus_cornes@yahoo.co.uk If you are unsure of your ability to join these sessions please contact me to discuss. Please Note; I have no formal kayaking coaching qualifications but am willing to pass on what limited knowledge I have. LOCH MADDY - SOUND OF HARRIS - TARBET/LOCH MADDY? Day1. Depart Friday 25th Aug on the 09.10 sailing from Uig to Loch Maddy. Disembark and make our way out of Loch Maddy and into the Sound of Harris where we will set up camp for the night, Distance 30'ish km's. Day2. What the weather decides to do today will dictate what we do. We could explore the Sound before heading around Toe Head and on to Taransay Island for the night or we could explore the Sound before heading up the East coast of Harris and camping for the night or stay within the Sound and return from Loch Maddy on day 3. We have options here which is good, Distance ? Day3. Will be dependent on where we end up on Day 2. We will either be returning to Uig from Tarbet on the 16.25 sailing or from Loch Maddy on the 20.40 sailing, Distance ?. This trip's itinerary will be dependent on weather conditions over the weekend. You will require a kayak trolley for transportation on and off the ferry and maybe even to cross causeways! The trip is aimed at more experienced paddlers who will be comfortable paddling a loaded kayak for the distances involved. Wind and sea state may become challenging. Paddlers joining this trip should be confident in handling such conditions should they arise. Hope to see some of you there.................James. 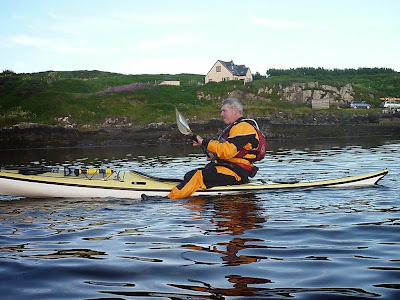 I am proposing a paddle from Struan to Talisker and return on Saturday. The forecast is for winds from NW/WNW 3 occasionally 4. Distance 22km, Please let me know if you would like to come along. Meet 0930 at Struan Jetty . Please bring spare clothes, food , drink, personal meds, suncream and rainhat! 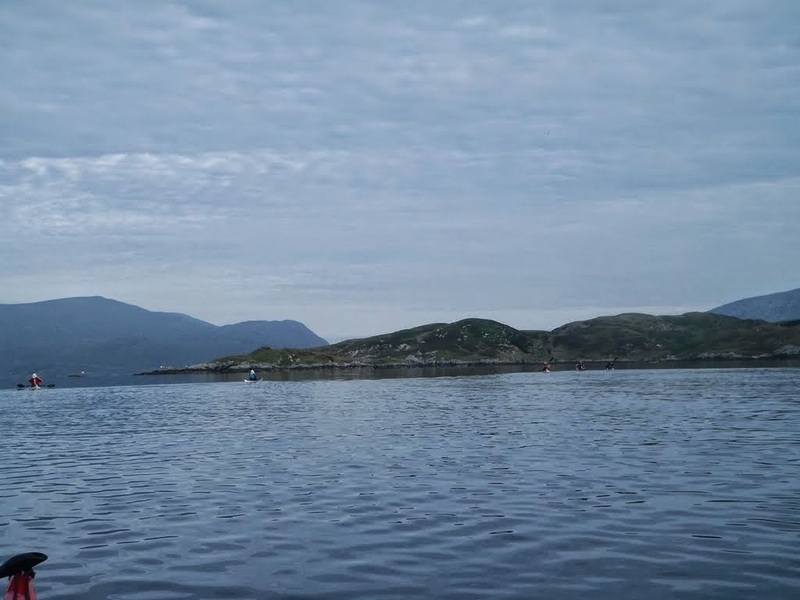 Circumnavigation of Scalpay from Sconsor, 30 July 2017. A select group of NSKC members (Alan, Will, Beverly and Ross) met at Sconser on Sunday morning to be led by Janice in a circumnavigation of Scalpay. Forecast was mixed including showers and the prospect of wind increasing to F5 depending on what authority was relied on. After the usual preliminaries and a comprehensive briefing from Janice we set off towards Scalpay and hoping to keep the island on the right once attained, i.e. go round in a clockwise direction. Assistant Leader Will took the lead for the 5 km crossing to Scalpay. After a nice series of zigzags (which I surmise was probably due to the fresh cross head wind and an inoperable skeg on the SS Pride of Great Britain, named in honour of the QE2 due to similarity in weight), we reached Scalpay. It had rained continuously since we had left Sconser, with varying intensity. While some may have failed to relish the conditions, I was gratified as it meant about 6 trips worth of salt was washed out of my cag. As we commenced our circumnavigation, Janice decided that, in the interest of the group, we should land for morning coffee. We landed close to Eileen Leac na Gainimh (Island of the sandy flags) and our spirits and waistlines were replenished with coffee and snacks. "Conglomerate is made up of rounded pebbles cemented together. The pebbles have been rounded by the action of moving water. This could be from a river or stream or from waves on a long ago beach. Because they have been transported by water the pebbles may be from a wide variety of rock types. The size of these rock fragments is over 2 mm in diameter.They are often sorted by size.After the pebbles have been deposited they are compacted by the sediments that pile up on top of them. Over very long periods of time the pebbles become cemented together by other minerals. Silica, calcite, and iron oxides are the most common cementing minerals. The rounded rock particles in the conglomerate are easily visible to the naked eye". 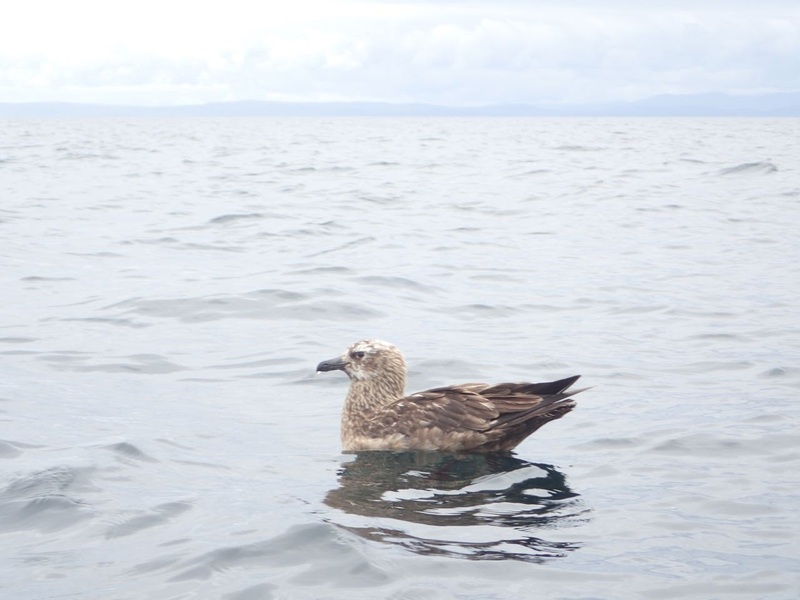 During this stage of the voyage there were a number of confirmed wildlife spots including grey and common seals and a sea eagle. There was at least one unconfirmed sighting. A leisurely lunch of at least one half hour in duration was had at the south-eastern end of the island, close to Scalpay House. During lunch we had a lovely discussion on the functionality or otherwise of various dry suit concepts, which was nice. As we paddled onwards toward Kyles Scalpay we came across a number of herons, all together, not in a tree, and a solitary deer. There was no noticeable tide flowing through the kyle, However, the wind was again across our course with some fairly fresh gusts coming down the glens between the various Red Hills. As we cross Loch na Cairidh towards Ard Doch we began to benefit from the wind. After Will’s skeg was deployed, he benefitted from it too. Fortunately, as rightly predicted by Alan, the rain stayed off after lunch and we even experienced sun to the extent that the more sensitive amongst us would have benefitted from the factor 50. The group arrived back at Sconser at around 4.30pm without incident. The ferry was avoided by at least 10 minutes! As ever, the sight of middle aged individuals in strange clothes sitting in plastic tubes provided much apparent amusement to the hordes waiting to catch the last boat to Raasay. Thanks are due to Janice for her curation of the trip and her excellent leadership throughout. Her attention to ensuring the group remained refreshed, de-watered and nourished was appreciated. Thanks to Beverly, Will and Alan for the company. PS - No photos as these seem to be putting people off rather than encouraging them. The delightful views of Scalpy, its wildlife and my paddling companions shall remain a mystery forever. Club Paddle 23rd July 2017, Achnacloich to Armadale. Evening Session by Harlosh Beach, 18th July 2017. Elevated views from Harlosh Point. Views from just above sea level. CLUB PADDLE - ROUGH WATER SESSION, Sunday 16th July 2017 on Loch Bracadale led by James. Met at 09.30 hours at Camus Ban, Harlosh. Attendees James Cornes, Ross Walker, Shirley Potts, Will and Beverly Mann and Neil Lankston. Having decided it was a good day to experience bigger water, James gave his safety briefing and we ventured out into the wind towards Harlosh island. Turning left crosswind and passing Harlosh beach bound for the western point of Wiay, we were accompanied by ‘quite large’ lumpy water. We then did an about turn and paddled towards the Maidens. Wind and rollercoaster waves were picking up (about force 5/6 with 2metre waves) so naturally James determined here was the perfect spot to practise rolling! Self rescues followed (obviously different to doing these in the shelter of Camus Ban), accompanied by heel hook rescues. Heading towards Harlosh, we then turned west with ‘skyscraper’ following sea and continuing wind into the comforting Camus Ban for 12.30 with drinks and flapjacks to finish. An exciting experience, showing us why James is a five star leader, and why Ross should be. Evening Session 11th July 2017. The session at Harlosh was well attended and the weather warm with the sea temperature a pleasant 12ºc. We headed out of Camas Ban and to the north following the coast and into the wind that made the sea a bit "lumpy". 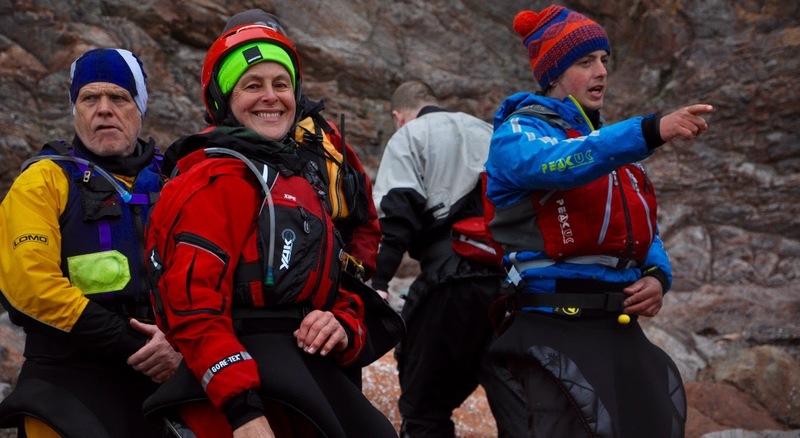 Gill, who had recently joined us and had a couple of short sessions in calm water capsized three times, was quickly rescued each time and remained smiling. She does enjoy wild swimming. Staffin to Duntulm Friday 7 July 2017. The planned weekend trip had to be cancelled due to the atrocious forecast for Saturday. A quick email managed to drum up Neil, Ross and I for this trip. We had a fine day exploring this stunning piece of coast and the lack of swell made it ideal for lots of rock hopping and caving along the way. We also had good views of White Tailed Eagles and lots of seals off Floddigary Island. With perfect timing we arrived at Rubha Hunish around slack water so no excitement there! Raasay and Rona Sunday 9- Tuesday 11 July 2017. This trip was also scheduled to replace the planned weekend trip. The Friday team plus James had a lovely trip in good weather from Sconser up the east coast of Raasay. A few midges on our Eilean Tigh campsite at the top of Raasay but the beer wine and spirits helped to lessen our awareness of their impact. Monday saw us around Rona then down the west coast of Raasay where a following sea gave us some good surfing runs to Fladda where we had lunch and sunbathing after a short (!!) portage across the causeway. Then it was down to Manish Point (a potential campsite) where James left us to press on to his car at Tianavaig as he had to be in work the next day. In the event we didn’t camp there and pressed on, and after some good rock-hopping along the coast we stopped at Inver for the night. Tuesday morning saw us up bright (well reasonably bright alcohol considered) and early for a quick paddle to Sconser to end the trip. Thanks guys for your company on both trips. The next time can’t come too soon. Evening Session 20th June 2017. Fifteen members paddled on the evening session at Harlosh. The group split into two, one group circumnavigating Harlosh Island, the other stayed at Camas Ban to practice rolling, assisted rescues, self rescues, hand of god rescue, re-entry and rolls and generally getting wet. James offered advice and encouraging words and Nick took some photos. All photographs on this web-site are subject to copyright. Fellow Paddlers; For your consideration and possibly participation please find below outline details of two club camping tips coming up in the near future, weather permitting as always. If you would like to attend, please in the first instance contact me at shamus_cornes@yahoo.co.uk to register your interest. More details will follow nearer the time. KYLEAKIN - SANDAIG ISLANDS/LOCH HOURN - KYLEAKIN. camp for a night or two ? Distance 16km..
Hourn, we can decide on the day). Distance 25/30km's. Day3. Make our way back up the Sound of Slaite and pass back through Kyle Rhea and back to Kyleakin. Distance ? any doubt of your suitability to attend this trip please contact me to discuss. CLUB PADDLE - ROUGH WATER SESSION. I am intending to lead a rough water half day session this Sunday on Loch Bracadale for club paddlers who would like to get a feel for some lumpier water, try some rolling, self rescues etc (all optional) or just to come for a bit of fun and experience, the session is aimed at 3'ish star paddlers or above who feel they can cope with the conditions and would like a wee taste of how much fun you really can have in a Sea Kayak! What we do with the session will be dependant on conditions on the day.The forecast for Sunday Bracadale is SW/W F 4/5/6. There will be experienced safety cover at hand and numbers will be limited. We will be paddling in a close group with the intention of paddling out of Camas Ban into Loch Bracadale. I would like to meet at Camas Ban for 10am and we should be off the water by 2.30'ish, this will include a snack/coffee/comfort break on Harlosh beach. Please dress appropriately for the conditions and if you are intending to practice some below the surface moves put on an extra layer as that water is still very cold, 11'c. If you would be interested in attending the above please in the first instance contact me at shamus_cornes@yahoo.co.uk to register your interest, if you have any doubts as to your ability to attend please speak to me. Please do not turn up announced on the day. First Evening Session, 9th May 2017. We had an excellent turn out for our first evening session at Harlosh. It was sunny and calm on Camas Ban and those who ventured out to Harlosh Island were able to find some lumpy bits. Click on the photo below to see an album of photos taken on the evening. Photos from Fiona, click on the above to see more. SCA Club and Volunteer Conference, Glenmore Lodge 21-23rd April 2017. Will and I arrived at Glenmore Lodge, Aviemore on Friday 21st for the SCA Club and Volunteer Conference with apprehension as to what to expect. Greeted by welcoming staff we were shown to our excellent accommodation with en-suite. Unloaded all our gear, registered with the SCA staff to receive our welcome pack, tee shirt and Tunnocks teacakes. Experiencing the Glenmore hospitality meant as much tea, coffee, and yummy cake as you want.Met members of canoe/kayak clubs from all over Scotland including, though we were unaware at the time, members of the SCA Board who are keen paddlers themselves. Buzzing with enthusiasm for the weekend everyone was on a high, conversation filling the air. Prior arranged activities for the Friday began after the evening meal. We had opted for the Rolling masterclass (Kenneth McIlroy and Sam Dean), so after a full meal had three hours rolling in the pool till 10 pm! Mega breakfast and packed lunch preparation was followed by introduction and workshop briefing in the lecture theatre and the pairing of coaches to members for their specific workshops, which ranged over all paddlesports. This was the setup for both days. We had chosen all day sea kayaking workshops: Saturday: Rough Water Handling in the Moray Firth (with Matt Haydock), and Sunday: Leading Sea Kayak trips out of Cromarty (with Calum McNicol). There was not only the option of splitting days into separate morning and afternoon activities, but also the choice of picking activities you had never tried. All equipment was free to use if required, and this included clothing. The weekend was such a success for us, a huge learning curve and a desire to return next year to try different disciplines, hopefully with other members from our club. Getting ready to launch at Hopman (Will and I in the middle). Learning how to deal with surf, awaiting a wave (Will and I on the left), Matt Haydock keeping watch. Will finishing his surf ride in. Having instruction from Matt after my ride in. Matt posing problems for launchings and landings from a leader's perspective round from Cromarty. N.S.K.C. Paddle From Elgol, 26th March 2017. Thanks to Alan for organising the paddle and to Ross for sharing his photos. 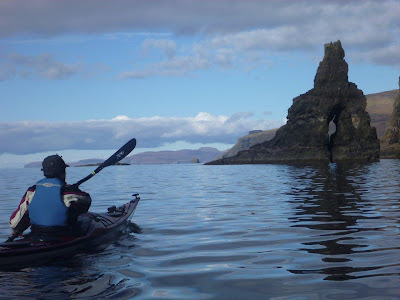 North Skye Kayak Club AGM this year will be on Thursday, 23rd February 2017 at 7.30 pm in the first floor Residents’ Lounge  within the Tongadale Hotel, Wentworth Street, Portree. Members are invited to attend. The kayak pool sessions got off to a good start on the 6th February 2017 despite the severe gale force wind which caused power cuts during the day and made the transporting of sea kayaks hazardous. During the well attended session beginners got an introduction to the basics while other members were able to learn or practice rolling, and self and assisted rescues. Here are some photos of the following session on 13th February. We were broken but survived. The trip also involved some haggis, cous-cous and a pot noodle. But what went on in Raasay stays in Raasay. Wildlife count - a few wee birds and some seals. As a change to the car shuffle last week Bob, Neil, Ross and Alan met at Sconser Ferry car park at 0930 for a no shuffle needed paddle. There was a cold breeze so there was brief mention of finding a cafe but hopes of sunshine prevailed so we set off for our trip. Within the first 20 minutes Ross spotted a sea eagle which was to be followed during the course of the day with several close sightings of otters. As we paddled through the sound we met a kayaker, Ally who turned out to be one of our newest members. He had launched from the Scalpay House mainland slip for a solo trip round Scalpay. He joined us for the rest of the day and Neil kindly ran him back to his car at the end of the trip. We were rewarded with blue sky and sunshine as we paddled along the outside of the Island and it felt more like Spring than Winter. This was another fine day out making it three Club trips in just over a month of the New Year. Let’s hope it continues this way. Eynort to Portnalong, 29 Jan. 2017, 23 km. With a forecast of sun and light winds, Alan, James, Janet, Neil, Ross, Shirley and Will met in Glen Eynort at 8.30 am, in the rain. The early start was planned to avoid a lengthy carry at the start of the day which is a feature of Loch Eynort. Luckily, the trip leader’s interpretation of the tide tables proved reasonably accurate and we found the loch waters gently lapping the edge of a muddy field. A car shuttle was efficiently performed and we were on the water for 9.30 am. As we paddled down the loch, sun was in short supply but at least the wind forecast had been reasonably correct with a gentle breeze from the South. As we made our way along the coast, interest gradually increased with numerous cliffs, gullies and other features. In general, a gentle swell made the paddling pleasant but the rock-gardeners amongst us had to be on their toes as occasionally a bigger wave sneaked through resulting in “interesting” conditions. Lunch was had on Talisker beach. Neil displayed his surfing skills to the group and also to his family who were gathered on the beach. The latter group were impressed (at least they said they were). After a shortish lunch due to the lack of sun and/or suitable benches for the partaking of lunch thereon, the paddling continued as before with waves, stacks, channels and added caves. And the sun came out; a wee bit at least. After entering Loch Bracadale, we were rewarded with a breeze from behind, which eased the last stretch of paddling. Wildlife sightings included close up encounters with three sea eagles. In summary, a very pleasant day. You really should have been there. Camastianavaig to Raasay, 21 Jan. 2017, 15 km. Alan, Gavin, James, Neil and Ross went for a paddle around the Sound of Raasay starting and finishing at Camastianavaig. Conditions were friendly particularly considering that it was the middle of January; light breezes and mild, although no sun was seen. A leisurely lunch was taken at Inverarish, where James made a new, excitable friend. After lunch we returned to Skye, met a boy called Pandora and a couple of paddlers standing up. A good start to the season’s club paddling! Paddle 2016/7, Food For Thought. May we take this opportunity of wishing you all the very best of Shristmasshes (spelt right, if you’ve had a few sherries) and a New Year full of excitement. The price will be £40 per person per block of four sessions each lasting 1.5 hours. Numbers will be limited to 10 folk sharing a mixture of sea kayaks and pool boats. Club members should refer to their email to see booking arrangements for these club sessions. 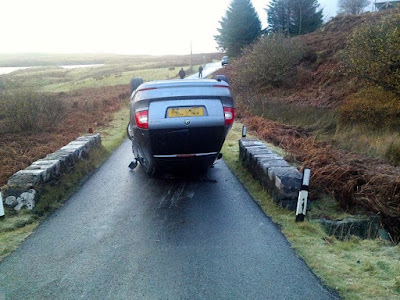 The planned trip this morning from Harlosh on Loch Bharcasaig did not take place due to Will and Beverly capsizing in their car en-route to Harlosh in very icy conditions. I hope that they did not suffer any injuries. Their kayaks were on the roof so they were also damaged. This means that without a car or kayaks the paddle that they organised on the 19th November 2016, Dunvegan Castle to Coral Beach, is cancelled. We hope that they are soon back on the road and the water. 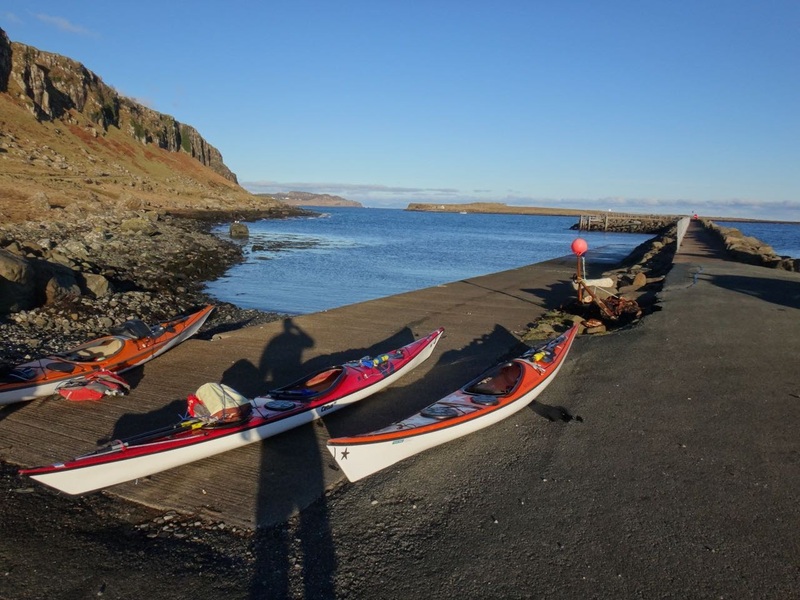 Struan to Talisker Bay and Return Sunday 20th November. The forecast for Sunday last night was looking good with light Northerly winds and bright sunshine forecast. As I write this the forecast has changed to bright sunshine and not so light northerly winds! So if we have light winds (which I think we will) I will lead a trip to Talisker Bay and return if the winds are to much for comfort and paddler abilities I will lead a trip from Struan to Ornsay/Bracadale area. The distance (Struan to Talisker and return) is roughly 22km and possibly better suited to intermediate paddlers, if unsure of your ability please do not hesitate to contact me to discuss. I would like to meet at Struan Pier for 09.30 and on the water shortly after. Please bring enough food and drink for the day, a spare set of clothes and any medication that you may require. If you could contact me at shamus_cornes@yahoo.co.uk to register your interest that would be great. Hope to see you there...............James. PPs. I have a helmet for sale if anyone is interested!! This Friday and Saturday, 18th and 19th November Will and Beverly are hoping to go paddling and would be happy for some company. Harlosh-Loch Bharcasaig (via Loch Vatten and Meall Greep) circular approx. 10 km. About 2 hours. Meet Camus Ban, Harlosh around 09.00 hrs, on the water for 09.30 hrs. Dunvegan Castle-Coral beach, return via Camus Ban. Approx. 16 km. About 3 hours. Meet and leave cars in layby situated after the first cattle grid after the castle (Grid ref. NG245497)around 09.30 hrs. Should this be taken, there are a couple after this. On the water for 10.00 hrs. Second breakfast at Coral Beach so feel free to bring snacks. Should we have missed anyone out, and/or you wish to join us, please let us know. Up the coast from the Three Chimneys, 4th November 2016. Slack water and with the sun on our backs four paddlers (Ross, Janet, Will and Beverly) ventured northwards from the Three Chimneys, the afternoon’s high wind forecast against the outgoing tide clouding the organisers’ thoughts. We completed the journey to Galtrigill to the accompaniment of sea eagles, herons, the compulsory seal and the fish farms’ speeding supply boat whizzing to and fro. Approaching the fish farms our ears were assaulted by the rattling resonation of feed being pumped through to the salmon. The coastline looked so different from the sea that pre-walked Galtrigill was unrecognisable, only a waterfall between clefts, but Ross kept us right with his smartphone GPS. With concern for prevailing weather and having got to our destination, we decided to return, stopping for snacks at a small pebbled bay looked on by an old ruin (not Will). 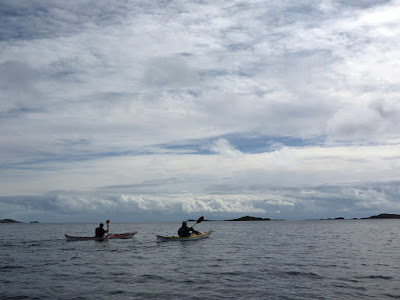 The wind picked up, and we retraced our paddle amongst clapotic waves https://en.wikipedia.org/wiki/Clapotis, getting back to the now pebbled, weedy shore of the Three Chimneys at 13.30 hrs, where after loading craft and a much-needed drink and chat, the rain started to fall. Click on photo to see an album of the trip. Congratulations to Will and Beverly! Congratulations from all club members to Will and Beverly on passing your "3 Star". Well done! A short paddle. Wednesday 2nd November. At 9 o’clock four paddlers (Alan Jones, Ross Walker, Will and Beverly Mann) met at Camus Ban, Harlosh and were on the water for 09.30 hrs. 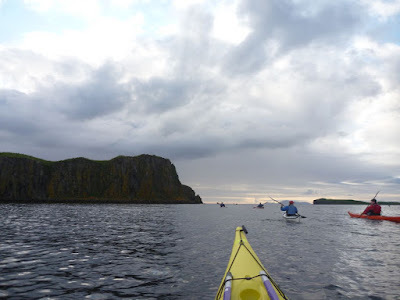 Outward bound on slack water and with much welcome chat we handrailed the coast with a short hop to Harlosh Island, which we circumnavigated in an anti-clockwise direction, spotting an otter, a pair of sea eagles and a seal. The water was so calm we all decided to continue on to Tarner Island to see the caves, returning to Harlosh Island beach for a ‘pee break’ and snacks. Ross and Beverly exchanged boats for the return trip to Camus Ban where we finished on rolls (kayak variety).Off the water for 12.30 hrs. Club trip catch up reports. (14th August to 23rd October 2016). It’s been a while since we had trip write ups on the site so I thought I should do some brief notes which hopefully may be of interest to members. If anyone who came on these trips has some photos I would appreciate it if you send some to Ken so he can put them with the write ups. Achnacloich to Armadale Sunday 14 August. 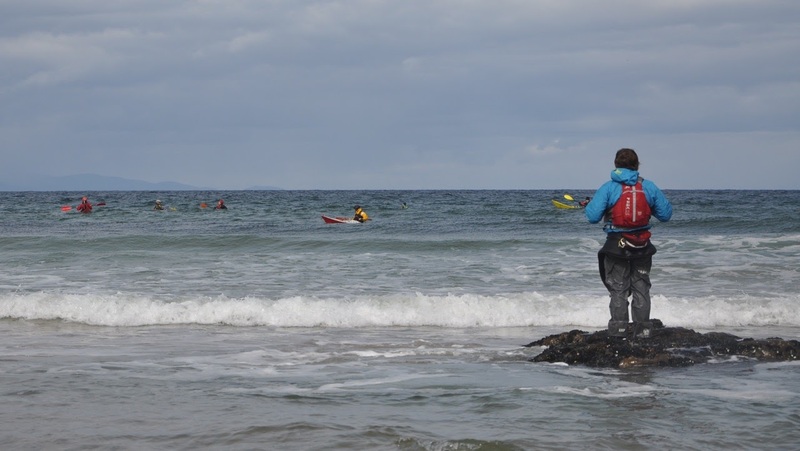 Nine paddlers enjoyed a fine day in nice conditions with some rock hopping and wildlife. We lunched by the lighthouse at the Point of Sleat where we were entertained by the midges and fortified with Beverley’s tasty homemade fruit cake. Meanish Pier (Loch Poltiel) to Camus Ban, Sunday 21st August 2016. 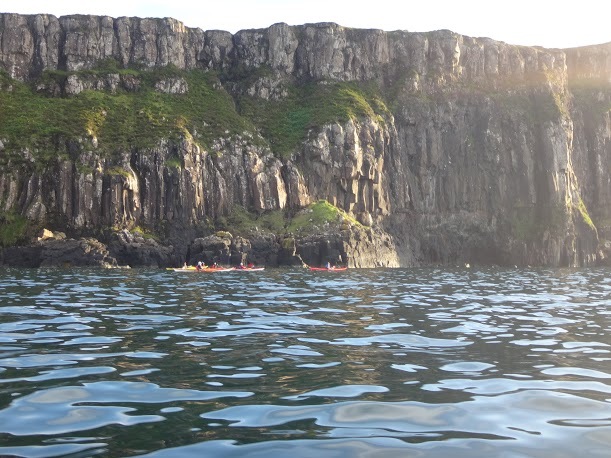 Six paddlers had a fine day on this spectacular part of West Skye, stunning cliffs, huge caves, arches and stacks plus lots of opportunities for rock hopping. Click on the photo above to see an album of photos taken by Ross Walker. South Harris camping trip Saturday 27 August to Monday 29 August. 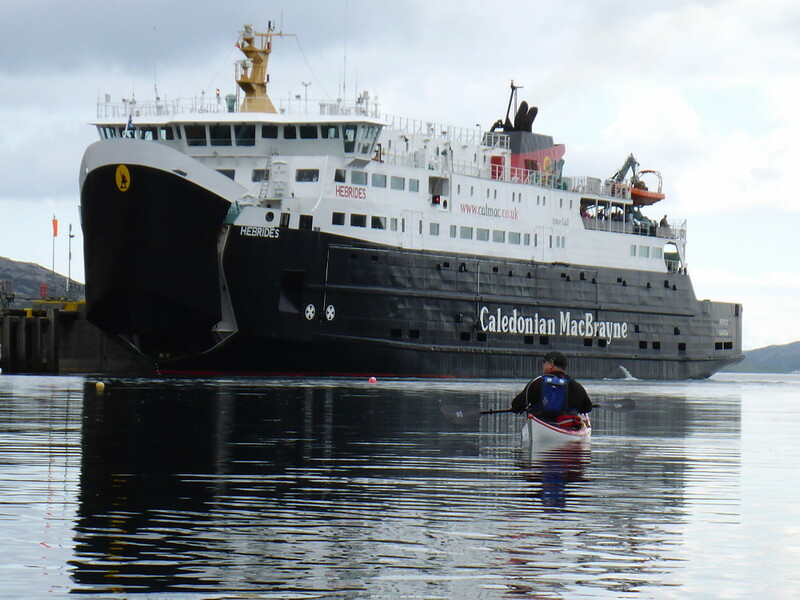 Seven hopeful paddlers met at Uig at 0830 prompt to wheel our loaded kayaks on to the ferry to Tarbert. We convened in the cafe over CalMac breakfast to plan our trip and decided to travel clockwise around South Harris. Having wheeled our kayaks from the ferry round to the Tarbert harbour slip and left our trolleys in the garden of friendly resident we had a pleasant afternoon paddling down the east coast to Rodal where we camped midge free and dry for the night. 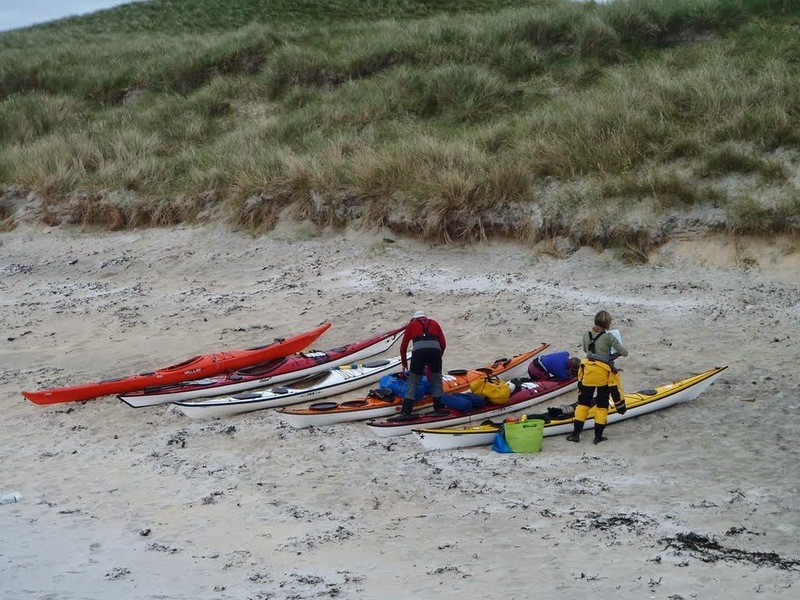 Sunday saw us up bright and early for our paddle west through the Sound of Harris stopping at Leverburgh to top up with water and elevenses, then on to Rudh’ an Teampuill for lunch. As we approached on lunch beach the wind switched on from the North West and stayed with us for the rest of the day. This gave us some waves and work around Toe Head and on the crossing to Taransay (our destination for the day). However, everyone coped well with conditions and we arrived safely on the east side of Taransay where we had a lovely open grassy place to camp. We had a good social evening under the stars with the tipple of our choice before retiring to our tents with the aim of dropping off to sleep before the snoring chorus began. 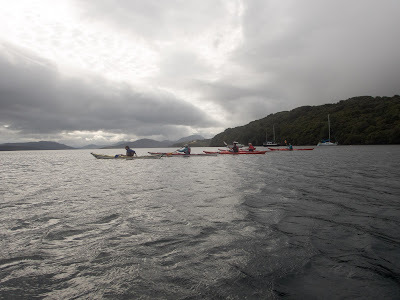 The next morning we had a relaxed start for the short paddle to Tarbet. It was good that the paddle was short as we had a long carry up a stony beach at the end of it. Having recovered our trolleys we loaded up and wheeled the kayaks across to the ferry terminal thus completing our “circumnavigation” We then had a civilised lunch in the distillery cafe before catching the ferry back to Uig. Thanks to everyone who came along. Click on the photo to see the album of the trip. Greshornish to Stein via the Ascrib Islands Sunday 9th October 2016. James and Ross lead 5 of us out from Grehornish slip to the Ascribs where we had lunch on the picnic table at the front of the house on the main island (the owners being away) We then paddled around the islands seeing lots of young grey seals and four sea eagles launching into the sky together. Then it was across to Waternish Point and into the wind and waves down to Ard Beag where we stopped for a well deserved afternoon tea break before heading to Stein where we ended the trip tired but happy. Club Paddle Saturday 22nd October and Sunday23rd October 2016. Having pleaded for company and failed (several people said they would loved to do the trip but unfortunately had other commitments) James and I left Kyleakin on a fine Saturday morning to paddle through Kyle Rhea to the Sandaig Islands for an overnight camp. As there were just the two of us we reduced our lazing around the camp and drinking time by adding in a paddle down to Eilean Donan Castle on the way. We had loaded our kayaks with a couple of sacks of logs so were able to keep a nice fire going on the beach on our island while we had our beers and blethered the evening away. Sunday was lovely and sunny and we had a leisurely paddle back to Kyleakin arriving back in plenty of time to get home and sort out our gear. 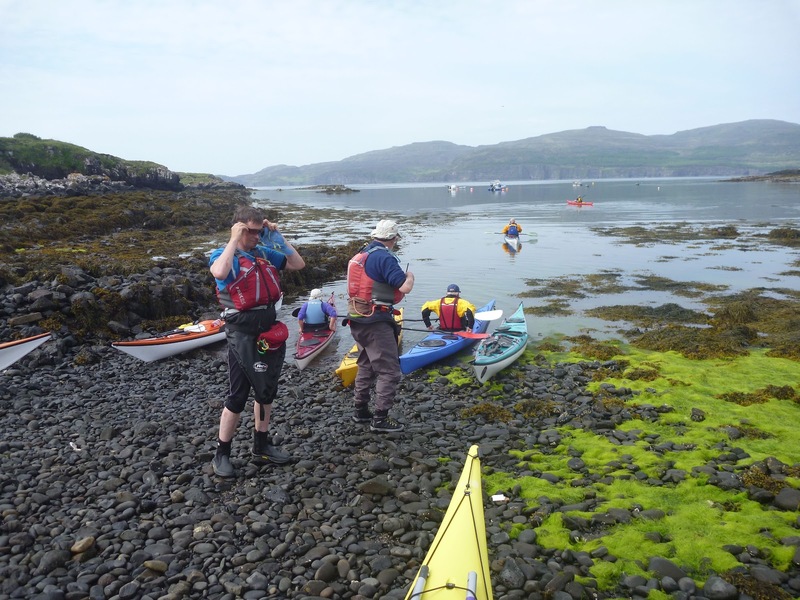 I am pleased to report that both James and Alan have successfully gained their 5 Star sea kayaking award. I am sure all club members would agree that they have worked hard to achieve 5 Star and they deserve it. Paddle, Sunday 3rd July 2016.
peoples wishes and the conditions. clothing for paddling, a change of clothing, packed lunch and drink. If you would like to come along please let me know. 25 June 2016 Scalpay (The Harris one). Click on the photo for photo album. Saturday morning found Alan, Gavin, James (our trusty Leader), Janet, Neil at Uig early and excited to be catching the Ferry to Harris. We were first on the boat and first up to the Cafe for full Scottish breakfast to fortify us for our day. After a short trolley round from the Ferry to the slip at Tarbert we got on the water at around 1130 and followed the coast to the Scalpay Bridge where we crossed over to the Island. As we had plenty of time we kept close to the shore rock hopping our way around to the Lighthouse where we had a second lunch, explored the lighthouse and watched some porpoise in the tide below. We then continued our exploration of the coast including a hidden harbour. We arrived back at Tarbert just as the chip shop had closed! Luckily the owner was only a few metres down the street so he turned back and unlocked the shop so we could get our fish suppers. Then it was on to the ferry where we relaxed with coffee/beer while Neil kept us chuckling with stories of “0n the buses” in Skye. A really good day out enjoyed by all. Thanks to James for arranging and leading the trip. Fellow Paddlers, below you will find details of two club camping trips coming up in the near future for your consideration and hopefully attendance. Trip 1. Torrin (Loch Slapin - Loch Eishort) Friday 5 August (PM) to Sunday 7 August. set up camp for two nights (10km). and paddlers abilities and experience ( roughly 20km). Day 3. Break camp and head back up Loch Slapin to our put-in (10km). on the conditions being suitable for their level of ability and experience. Trip 2. Harris Circumnavigation (Saturday 27 August to Tuesday 30 August). Day 2. Taransay to Rodel via Sound of Harris (25km). Fantastic paddling day, camp at Rodel. trip should be confident in handling such conditions should they arise. If you would be interested in attending any of the above please in the first instance contact me at shamus_cornes@yahoo.co.uk to register your interest, if you have any doubts as to your ability to attend please speak to me. Sunday 5th June: Camas Ban (Harlosh) to Macleod's Maidens and return. The group - led by Alan (with Ross as his glamorous assistant) - launched a little after ten o'clock from Camas Ban heading directly across the loch before working their way out towards Idrigall Point. With next to no wind, clear skies and about as much sun as was seen through all of last year, the loch was a pond reflecting the stunning landscape perfectly. This was a day of extreme (spring) tides meaning a lot of the usual playground - caves, nooks, arches and the like - were out of reach, however this did give a rare opportunity to explore a whole new playground giving the group some practice with rudder strokes while rock-hopping through the maze of rarely seen obstacles. A brief stop was made at Cama na h-Uama for lunch where those in drysuits were made to regret their decisions in the windless sun-trap. This discomfort was perhaps alleviated by the absolutely stunning views across the loch to Wiay and the Cuillins. From here the group carried on round the headland to the Maidens exploring a few more caves along the way. After a spell circumnavigating the sea stacks (as much as the low tide would allow) and taking in the scenery, the group headed back round the headland a short way before aiming directly for Harlosh Island. A brief stop at the beach allowed for some to practice their rolling and others to simply cool off in the water (while dodging jelly fish). From here it was a short hop back to Camas Ban for around four o'clock. On behalf of the group many thanks to Alan for not only organising such a great trip but also the fantastic weather to go with it. Click on photo to see trip photos! Click on the photo to see evening session photos! This evenings session was very well attended and lots of the club’s equipment being used by members. It was a lovely sunny evening with a 25 mph wind from the north, with the wind calming later in the evening. 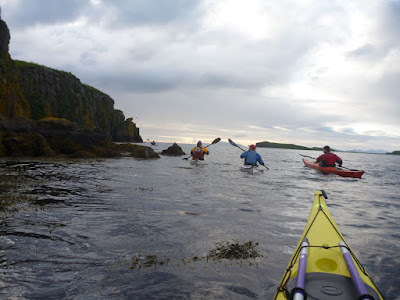 We split into two groups, one remaining in the Camas Ban area improving their kayaking skills and then followed the coast towards Loch Vatten. The other group went to explore the cave at Loch Bharcasaig, unfortunately the tide was too low to travel all the way through. Bruce did extremely well to capsize twice and remain warm even though he was not wearing a wet or dry suit. Kevin kindly swapped kayaks with him and he seemed more stable. Towards the end of the session lots of self rescues and rolls took place. Sunday 29 May 2016 Camus Ban to Talisker Bay and return. Once again we had 8 paddlers (but not the same 8) out on the water. 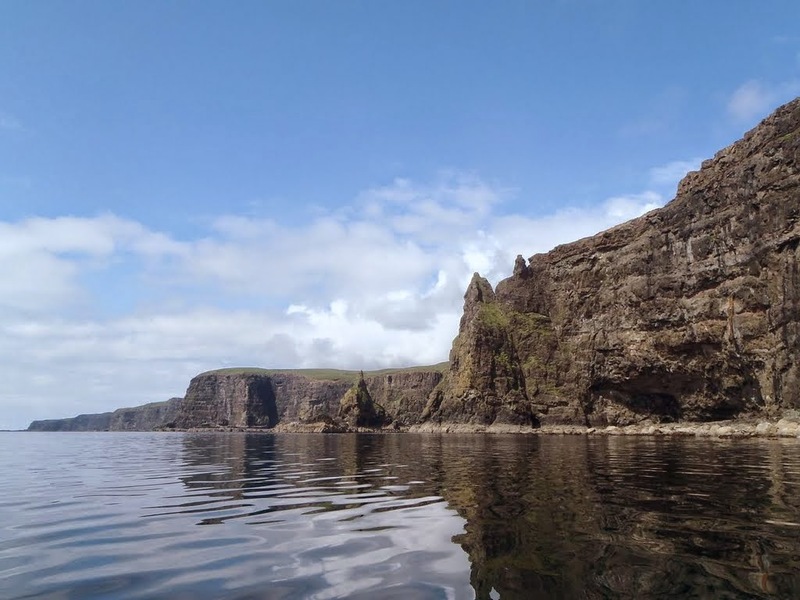 We had superb conditions for a leisurely paddle out via the West side of Harlosh Island and the outside of Wiay from where we crossed to the huge cliff at Rudha nan Clach and then rock hopped our way to Talisker Bay for lunch. We returned via the North side of Wiay where as we rounded the end and could see ahead to Harlosh Point we encountered a stiff breeze which was against us all the way back to Camus Ban. Thanks to James for organising the trip. Sunday 22 May 2016 Allcomers trip Stein to Clett, Mingay, Isay ,Coral Beach and return to Stein. This was another trip aimed at those who had not paddled much during the winter and newcomers to the Club. 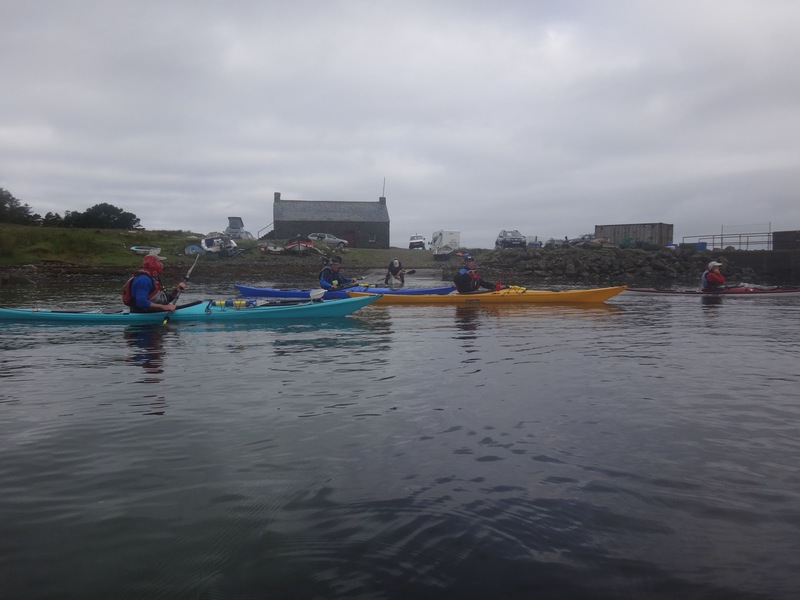 The 8 paddlers headed out direct to Clett then on to Mingay and Isay where we stopped to walk round the remains of the 16th century house that was occupied by the MacLeods of Lewis. Then we went on around the island to Coral beach for lunch and tourist spotting. Having enjoyed lunch and blether in the sunshine we headed back to Stein. Evening Session 18th May 2016. According to the latest forecast, tomorrow night looks as though it will not only be rather windy but wet too so we have opted to go for Wednesday instead when the sun will shine then you can opt for getting wet if you choose! Can you let me know if you need a boat and other equipment asap then we can sort out transportation. If you can help with this then that would also be good to know. Ray, I have you noted for a boat but unsure if the date change suits; perhaps you could confirm. Sunday 15 May 2016 Allcomers trip Ord to Dunscaith Castle to Suisnish Point to Heaste and return to Ord. This was the 1st Club day trip this year aimed at those who had not paddled much (if at all during the winter) and newcomers to the Club. An enjoyable day was had by the 8 paddlers that came along. We stopped for lunch and a guided fossil tour (thank you Janet) next to pretty waterfall at Boreraig . Back at Ord we had a brief wet session in the bay. Evening Session, 10th May 2016. There was a very good turn out for our second evening session of the year. It was a fantastic sunny evening with an invigorating breeze from the east. We met at Stein car park by the jetty and managed to get on the water by 7.30. It was decided to split up into two groups, one bound for the Coral Beach and the other following the coast northwesterly towards Port na Cagain. The Coral Beach bound group felt the effects of the wind as they crossed Loch Bay. The group following the coast had the assistance of the wind on the way out but it became more sheltered further on. It was ideal for a bit of rock hopping and rescue demonstration and practice. Malcolm is to be nominated for a Bafta award after acting as a casualty in the water with a dislocated shoulder! Everyone enjoyed a good paddle. We are starting our evening sessions on 3rd May 2016, meeting at 1900 to get on the water for 1930, at Caroy Jetty. Well done to Alan who passed his 4* assessment and well done to Ross who completed his 4* training. Navigation and Tidal Planning Wednesday 13th and 20th April 2016. Some of you indicated at the AGM that you would like some work/classes on navigation and tidal planning. I am willing to do this and pass on what limited knowledge I have of the subject, please be aware I have no formal qualifications on the subject just happy to pass on what I know. Gavin has managed to get us use of his works conference room for both of the dates (Wed 13th April and Wed 20th April) I will be looking to start these sessions at 7pm both nights. To be able to source, interpret and apply weather information to the coastal environment. 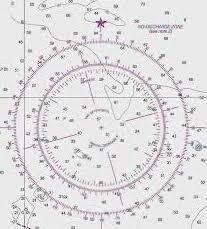 To navigate on the water using visual references and simple pilotage techniques e.g. transits and dead reckoning. To be aware of the range of resources required to plan trips in the coastal environment. On the night you will require; Silva type 4 or similar compass suitable for map work. North Skye Kayak Club AGM. Our Club AGM this year will be on Wednesday 10th February 2016 at 7.30 pm in the Residents’ Lounge  within the Tongadale Hotel, Wentworth Street, Portree to which all members are cordially invited. This time we are going to run the sessions on a more structured basis which we hope will benefit all levels. The first 45 mins, or thereby, will be instructor led followed by practice with a buddy and to allow this to work efficiently numbers will be limited to 10 enabling all to be in the max number of boats allowed at the same time. The “down” side of this is that there will have to be an increase in cost per head to £37 per four sessions. We hope this is of interest to you and look forward to receiving your payment as soon as possible and if you have any questions then please just ask. STEIN TO WATERNISH POINT SUNDAY 4TH October. I am intending to lead a trip this Sunday "Weather Dependent" Stein to Waternish Point returning back to Stein. The trip distance is roughly 25km and possibly better suited to paddlers who are comfortable with the distance and the possible conditions that may be experienced, if you have any doubts about your suitability for this trip please contact me to discuss. I would like to meet at Stein for 09.00 and be on the water shortly afterwards. Please ensure that you bring with you enough food and drink for the day a spare change of warm clothes and any prescribed medication that you may require. If you are interested in this trip please in the first instance contact me at shamus_cornes@yahoo.co.uk to register your interest. Hope to see you there.................James. CLUB CAMPING TRIP 19th & 20th September 2015. I am arranging a short camping trip for this weekend weather permitting. This trip is open to all members, bit of an end of season social....Bring Bevvy/Nibbles! I am intending to head South to Loch Eishort. 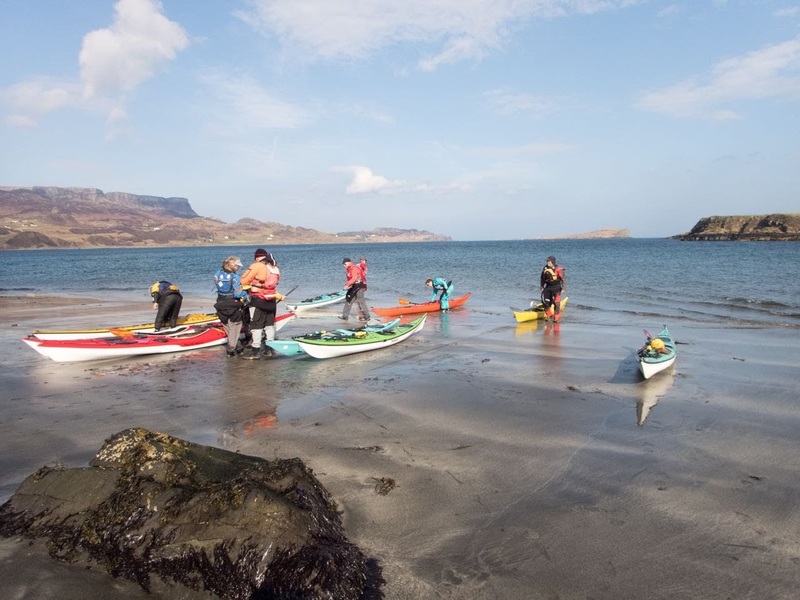 Our put in will be decided on the day but possibly Tarkasvaig, Torkavaig or Ord this will be dependent on abilities of paddlers present on the day. We would then explore Loch Eishort or possibly go straight to our intended camp spot for the night the old abandoned village at Boreraig which is just full of interest and it makes for a cracking camping spot. If we go for the set-up-camp first option we could then go for a paddle around Eishort with empty boats returning to our previously erected tents etc. On my last visit there was a few pieces of driftwood on the shore but possibly not enough for a decent fire, if we could all bring maybe some house coal or something combustible it would go along way to a) maintaining the ambience b) keeping us warm. The forecast at the moment for Saturday is light winds with clear skies. Sunday there will be more wind and rain but hopefully not as much as is forecasted anyways it will be a short hop across to our take out so it should pose no real problems. Looking to meet at 10.30 Saturday and to be off the water by 12.00 on the Sunday. Ps. Meeting location will be decided Friday night. NSKC Alternative Paddle Sunday 30th August 2015. 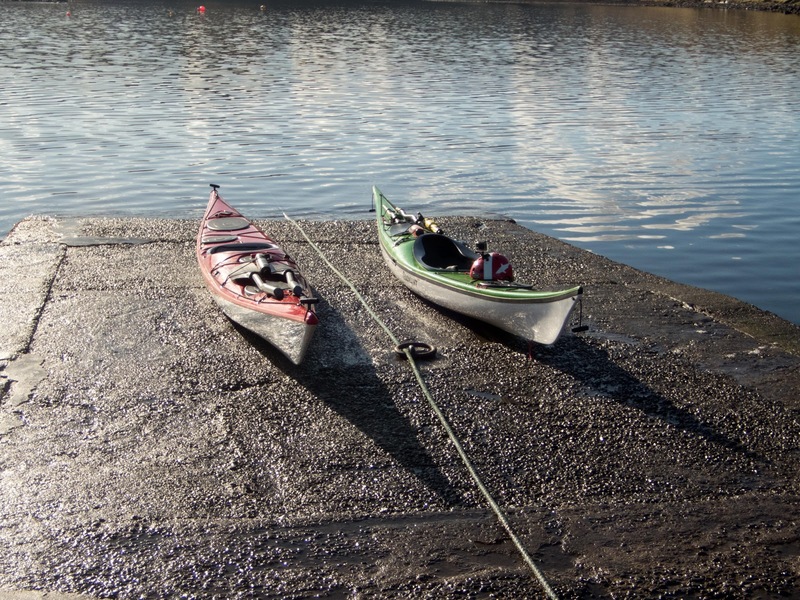 The "Alternative Paddle" took Place in Loch Portree and Camas Ban ( the Portree one) around the Portree harbour area. There were six paddlers and it was organised so that we could brush up our paddling skills and at the same time have an enjoyable paddle in the rain and the wind. We launched close to the Sailing Club and made our way across the harbour to an area near the beach where we were sheltered slightly from the wind. Lunch was eaten on the beach as we watched the tour boats looking for the sea eagles. We then paddled towards the Lump and the main part of the harbour and searched under the pier for the resident otters who take advantage of the fishermen. Click on picture to see photo album. Meanish Pier to Camas Ban Sunday 30th August 2015. James intended to lead a paddle from Meanish Pier (Loch Poolteil) to Camas Ban (Loch Bracadale), weather permitting. It would have been a 32km trip taking eight hours with the expectation of some wind over tide with some lively swell and little chance of making a landing. 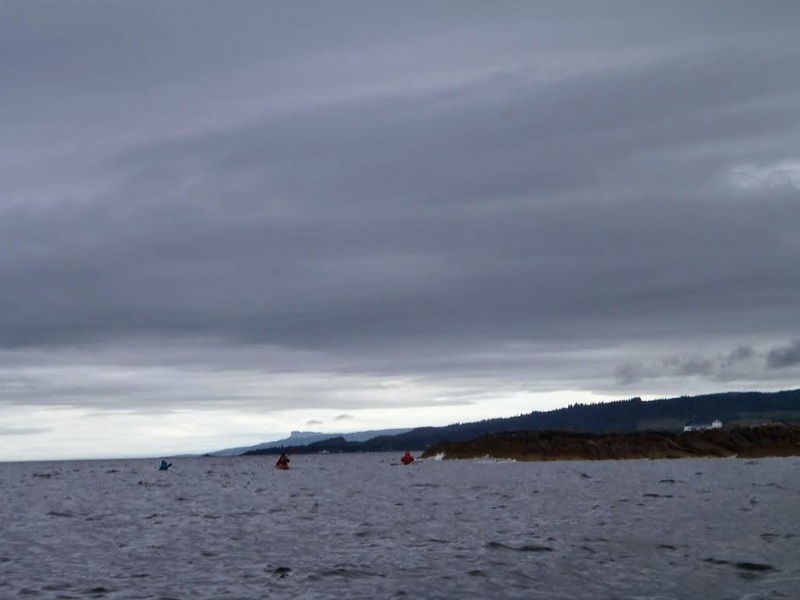 After checking the forecast, which was not very favourable, plans were changed and it was decided to meet at Camas Ban and paddle on Loch Bracadale where conditions were still very lively. See Ross’ excellent video to see what the sea was like. Evening Session 25th August 2015. After meeting at Camas Ban, nine club members paddled towards Harlosh Skerry to circumnavigate Harlosh Island. It was an evening of waves and caves as we travelled the 7.1 Km round trip. With the evenings drawing in, the sun setting just after 8 o'clock, it could be our last evening session in 2015. Evening Session 18th August 2015. Click on photo to see pictures of the trip! 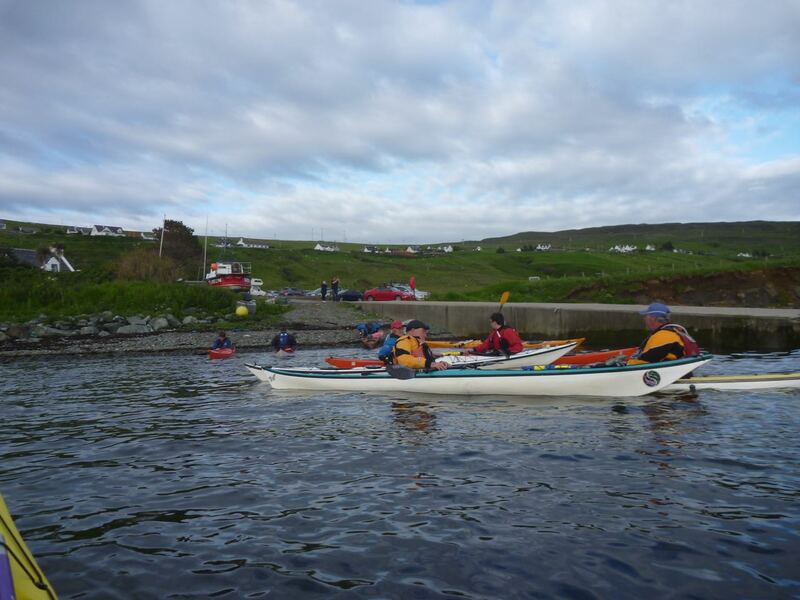 Twelve club members met at Meanish Pier at 7 pm on Tuesday 18th August 2015 for an evening paddle to Neist Point. It was a rare warm sunny evening, we have not had many of those this year. We left Loch Pooltiel traveling west to follow the coast to the south. The rock formation and cliffs are fantastic as can be seen in the photos taken by Jan and Ross. As we got close to Neist Point the tops of the cliffs were dotted with people taking in the views of the light house and the surrounding area. There was also someone at sea level by a small cave and small rocky beach. We were not sure how he got there but he did not shout for help when he saw us. We could not linger for any length of time as the light was going as the sun set over the Outer Hebrides. Before we reached Meanish Pier it had turned into a night paddle. It was a very enjoyable evening. CIRCUMNAVIGATION OF SCALPAY (The Harris One!) SATURDAY 15TH AUGUST. I am intending to lead a day trip over to Harris to paddle around the Island of Scalpay (weather dependent). The trip will depart from Uig where we will (hopefully) board the 09.30 ferry to Tarbet. On arrival (11.10) we will trolley around to the put in at East Loch Tarbet where we will then set off for Scalpay. We will require to be back at the ferry terminal in time to catch the 21.00 ferry back to Uig (22.40). This trip is roughly 20-25km's and will be suited to those paddlers who are comfortable with the distance within the time allowed! You will require the use of a trolley to board/disembark the ferry and to trolley around to the put in. Could you please ensure that you bring with you enough food and drink for the day,spare change of clothes and any prescribed medication that you may require. East Coast of Skye trip Friday 24 July to Sunday 26 July 2015. 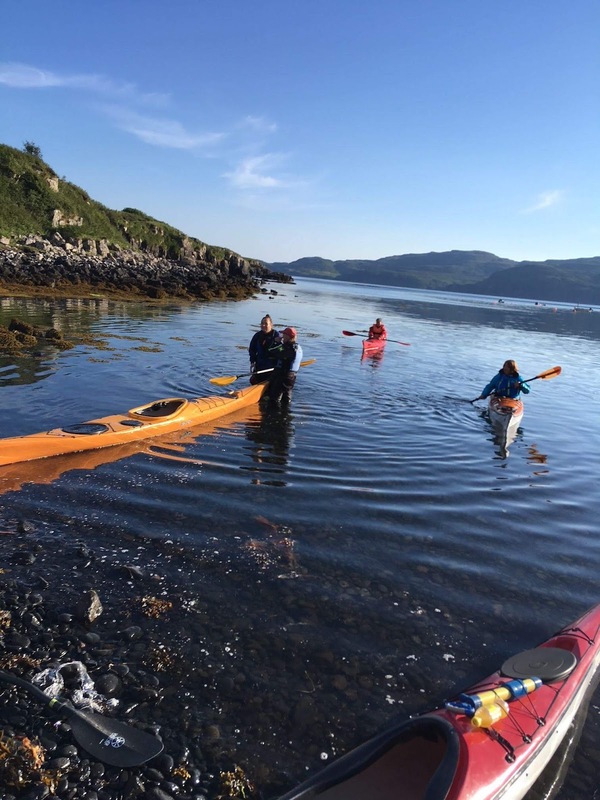 An intrepid group of paddlers, comprising James, Gavin and Ross met at Camus Mor on Friday evening, to be led by our Chairman, Alan, on a voyage round the Northernmost tip of Skye and down the East coast to Camustianavaig. The weather was benign (in theory, see later) with low wind and moderately overcast skies. The forecast was similar with light North/North East winds forecast for Saturday and Sunday to aid our southerly journey. 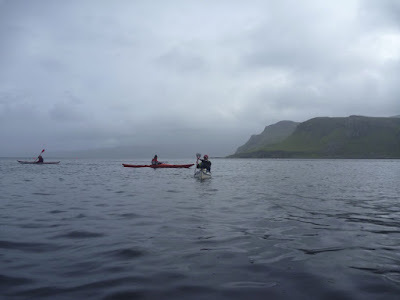 The group paddled in a north-east direction to Ru Bornesketaig and then across the bay, Lub an Sgoir, to Rubha Voreven. The islands in the Minch looked invitingly close and it was suggested that the paddle could be extended to encompass at least the Cleats. However, the sage advice from Alan was that the tides were not quite right for this, so the group indulged in some mild rock hopping along and around the northern tip of Skye, Rubha Hunish. Shortly afterwards, we arrived at our campsite for the night, Lub a Sgiathain. Almost immediately, it became apparent that while the conditions made for a pleasant evening’s paddle, there was a price to pay. The midges were evil. Thankfully, all members of the group were experienced outdoor people, if not kayakers, and had come prepared with midge nets. Somewhat surprisingly and showing considerable faith in the accuracy of the weather forecasters, one of the group had set sail without any long sleeve top, which gave us an opportunity to test the efficacy of Avon “Skin So Soft”. After a tea taken under canvas, we set off on foot, towards Rubha Hunish to take in the sunset over one or two post-prandial cocktails. A quiet night ensued and Saturday morning arrived with bright sun and light winds. After breakfast, our group split, with our aspiring 5* paddler deemed capable of paddling back to our starting point for a weekend of domestic duties while keeping tabs on the results of the first round of the Petrofac Training Cup. Alan, Gavin and Ross set off south after liberal applications of factor 25 sun cream. Shortly after setting off, it was decided that due to conditions, it would be appropriate to extend the day with a circumnavigation of Eilean Troddy. The calm sea meant that it was ideal conditions for seabird spotting. The species noted included but were not limited to: puffin, guillemot, razorbill, great skua and, possibly, a juvenile long tailed skua. After rounding Eilean Trodday, we headed back to Skye to enjoy some exploration of the features of the stretch of coast round to Kilmaluag Bay. As we approached Kilmaluag Bay and elevenses, Gavin spotted a small group of porpoises. This was our only spotting of “big fish” over the three-day trip. Suitably refreshed, we continued our trip south. The next stretch of coast down to Flodigarry is dramatic, with many caves, arches and stacks. We noted that one of the more interesting caves had had its mouth blocked off by a significant rockfall. As our trip continued we saw evidence of several significant rockfalls on both the coastal cliffs and those around the Quirang. Perhaps this is a consequence of our recent weather? We arrived at Staffin beach in the early afternoon, where a leisurely lunch was taken in the sun. Suitably fuelled and refreshed, the group set off south for our final destination of the day, Rubha nam Brathairean. While this stretch of coastline is dramatic from a visual and geological perspective and includes Kilt Rock, it is less interesting from a kayaking perspective. We made good progress and reached the camping spot at around 5.30pm. The total distance travelled was 16.3 miles. Due to the bright sunshine, tent pitching and the making/taking of tea was a pleasant midge free experience. We then set up to watch for the arrival of Malcolm M. who was paddling south from Staffin after a hectic day serving the Portree populace. Malcolm was spotted at about 8.15pm and was guided to the landing spot to join the group. The remainder of the evening was passed in deep discussion of philosophy and the arts, with Alan and Gavin contributing their opinions on the relative merits of AC/DC’s Bon Scott and Brian Johnson. Due to the northerly wind direction, the temperature dropped significantly over the evening to the extent that no midge net was required. Sunday morning arrived, with the sun shining and wind remaining light from the north. The group, including Malcolm continued south through calm seas driven by a gentle northerly swell. This next section of coast is very different from what had been experienced so far. Typically, the coastline is formed from sedimentary rocks with many table like features, which may or may not feature dinosaur footprints. Above the shore, vegetated cliffs rise to considerable height. As ever, Alan found plenty of opportunities to demonstrate his fine honed close control paddling skills amongst inlets and passages along the coast. The one and only stop of the day was at the Storr Lochs power station beach where a sandy break was located amongst the boulders. The previous night’s forecast had predicted strengthening wind from the northeast. However, this failed to appear and our journey south continued in calm and rather warm conditions. To add interest, a series of scientific speed trials were held for the boats on the trip. It was established that the maximum speed of both a Northshore Atlantic and a Rockpool Alaw Bach was of the order of 5.8-5.9 mph. However, the maximum speed of a Northshore Ocean 17.6 was found to be 7.1 mph. Those that know the group may choose to conclude that some other factor may have influenced our results. Our first sea eagle of the day was spotted north of Portree Bay. Unfortunately, the trip photographer was not able to point his camera in the correct direction to log this sighting for posterity. To simplify trip logistics, Malcolm and Gavin headed for Portree, while Alan and his charge continued round Ben Tianavaig to journey’s end. As we approached Camustianavaig, Alan spotted two sea eagles sat on a boulder on the shore. This time, our photographer managed to override a sophisticated autofocus system and capture some blurry images of the birds. Subsequently, we came across the nautical equivalent of “trainers on Ben Lomond in January” in the form of four fisherpersons in a small boat with one of them utilising the raised thwart to perfect his/her casting technique. Like the many that wear trainers, I’m sure that this group survived to fish another day, possibly due to the absence of the forecast force 5. Due to Alan’s detailed planning, landfall was made at Camustianavaig at high tide limiting the effort required to load the boats onto the waiting car for the trip back north. The drive north was taken at leisurely pace with no incident. The journey was considerably enhanced through Alan treating us to what is probably the second best recovery food for endurance athletes, ice cream bars. Total distance paddled was 16.6 miles. Thanks to Alan for proposing and leading the trip and to Gavin, Malcolm and James for the company. Click on photo to see photo album. Evening Session 14th July 2015. 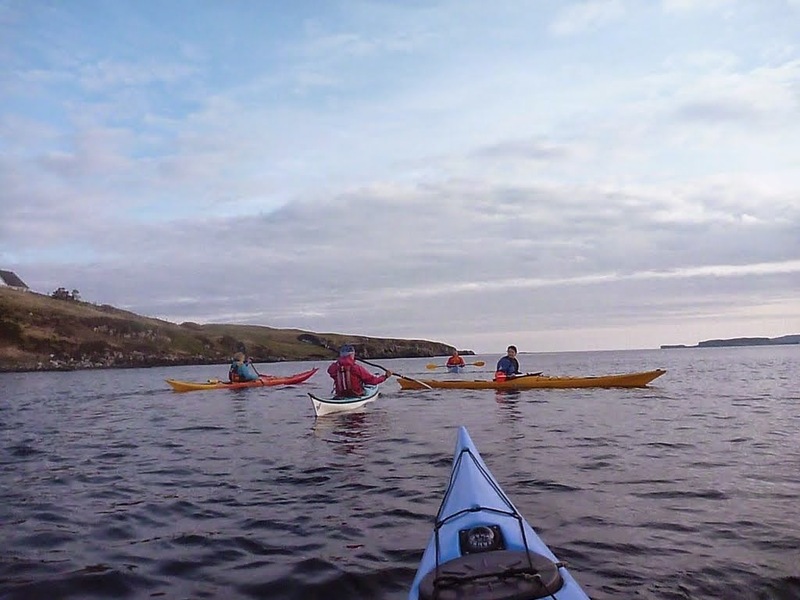 Ten club members met at Stein at 7pm and paddled out towards The Little Minch to circle the islands of Clett, Mingay and Isay. On the way out we were pleased to see porpoises and sea eagles and later the sea eagle's nesting sites. The trip was about 13 km, ± 1 km depending upon the method of measurement. It was a pleasant paddle with choppy bits in the more exposed areas. Isle of Scalpay 12th July, 2015. After a bit of a slog up the west coast into some wind and flow we paused for first luncheon in the shelter of Camus na Geadaig translating as Lazy Beds, Lock of Hair (Scalpay!?) or Pike depending upon your preferred translation. Onward all the way around to the south-east for second luncheon at Camas na Fisteodh before another bit of a slog into the wind back to base. Fairly strong winds in places but without fetch made a goodly 20K paddle, oh, and we saw two eagles (but no whale-like beasts), sorry! Around Harlosh Island 23rd June 2015. Seven club members met at Caroy Jetty and headed out to Harlosh Island. Andrew tried out the new Valley Nordkapp giving it a thorough test, he found it to be a nice boat but too large for him. We stopped at the beach so that Andrew could adjust his back rest then we continued around Harlosh Island in an anticlockwise direction. On the east side we were paddling into the wind and waves. It was a pleasant evenings paddle apart from the midges at the jetty when we returned. 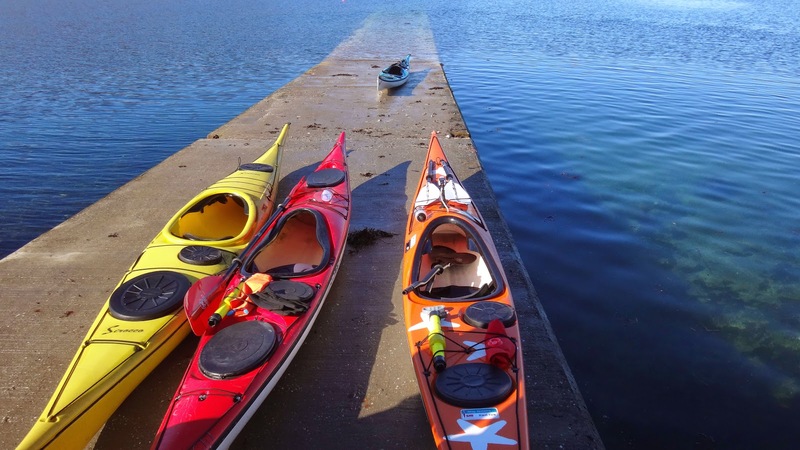 North Skye Kayak Club's new Delphin sea kayak has arrived and along with a North Shore Atlantic and a Valley Nordkapp completes our fleet of new kayaks for the use of members. Also we still have two Scorpio LV kayaks. SOUND OF HARRIS FRIDAY 7th AUGUST TO SUNDAY 9TH AUGUST. I am intending to lead a club trip out to the Sound of Harris. This trip will start on the Friday morning at Uig where we will catch the early morning ferry (09:10) to Lochmaddy from Lochmaddy we will make our way out and into the sound where we will camp. Over the next two days we will explore some of many islands and attractions the sound has to offer finishing off back at Lochmaddy on the Sunday in time to catch the late ferry (20:40) back to Uig. I anticipate we will be paddling 25-30km per day. The above plan is very weather dependent and may have to change as wind and sea dictates. 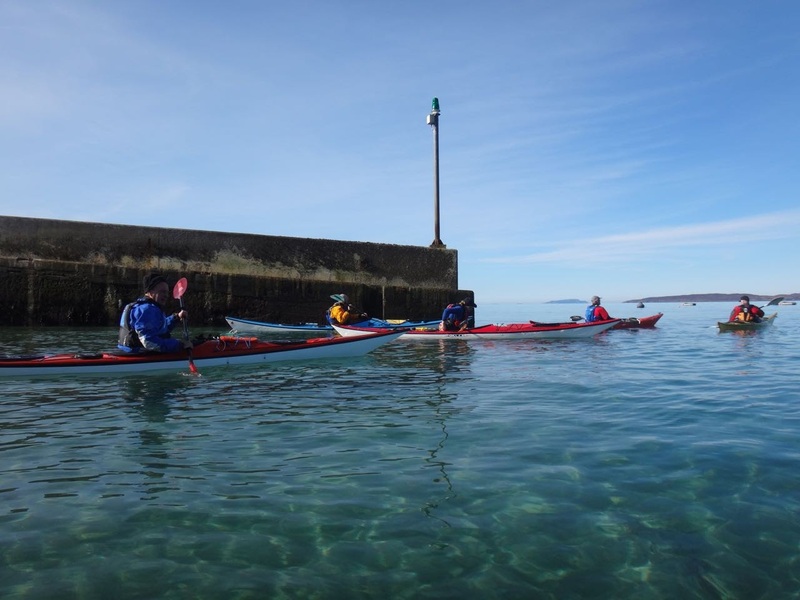 This trip will be suited to more experienced paddlers who have been paddling on a regular basis, have some experience of tide, are comfortable with the distances and are aware that wind and sea states may become challenging. Members wanting to join the trip should therefore be confident in their ability to handle such conditions should they arise. For those paddlers who would be interested in attending or are unsure of their suitability for this trip please contact me at shamus_cornes@yahoo.co.uk . I will hopefully (given time) organise a club trip down to Kyle Rhea for some paddler Introductions and Re-introductions to tidal paddling for those interested in the above trip, therefore your early intentions to attend would be appreciated. Plan "A" or Plan "B". The plan was to leave Sconser on the Saturday, travel up the east side of Raasay and make camp at the very tip of the island. The Sunday was to be spent exploring the isle of Rona, before returning to Sconser via the west side of Raasay on the Monday. So at half past ten in the morning Ross, Alan and Andrew loaded their boats and launched. So much for that plan; thwarted by a strong northerly wind that would have turned an enjoyable three days in to a long, hard, slog. So this was Plan B, and a great backup plan it turned out to be. From Elgol the group headed directly across to the isle of Soay. Though a persistent cross-wind made the sea less than calm, the dazzling sunshine more than made up for it. Once sheltered by Soay conditions were quite placid, and with the stunning views over to the Small Isles and beyond it was a bit like paddling through something from a tourist brochure. Lunch was had at the very south of the island which gave an opportunity to relax in the tranquility, and absorb the view. The peace was briefly interrupted by one of the group (that would be me) making a mad dash to recover his kayak which appeared to be impatiently keen to get on with the journey. 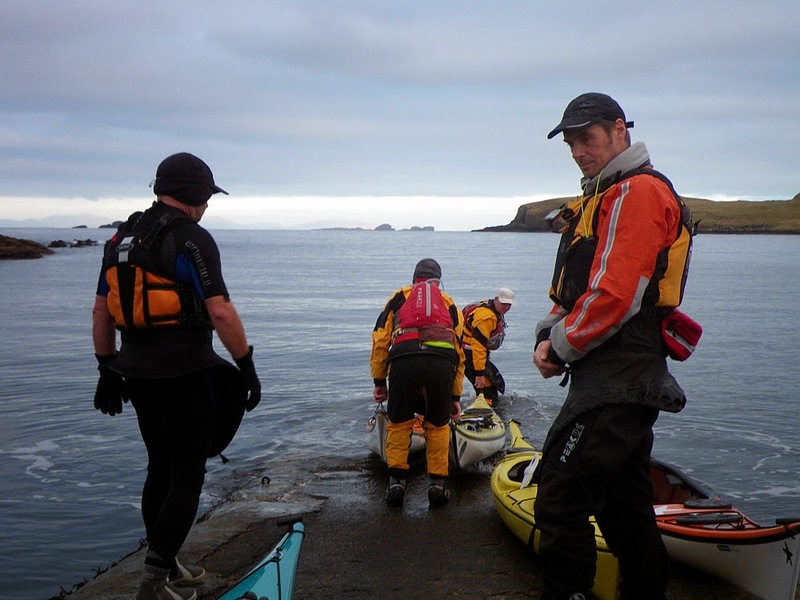 After rounding the west of the island, meeting another group of kayakers on the way, the group headed round to the harbor to see the remains of the basking shark hunting operation run by Gavin Maxwell, and later by Tex Geddes. From here the group headed directly across to the Rubha an Dúnain headland and on to the point where camp was setup for the night. With so much history in such a small area this has to be one of the most fascinating parts of the island; with a viking-built canal (very helpful for getting the boats landed), a chambered cairn, and the remaining wall of a broch (perfect for sheltering from the wind for dinner and enjoying the views). After eating an early breakfast while watching a couple of porpoise playing nearby the group were on the water by eight o'clock. What was left of the wind had gone and conditions couldn't be more calm, with the sun even making it's presence felt later on in the morning. The group headed north-east to Coruisk for an early lunch, watching the seals playing in the water in the piece and quiet before the first of the days boat tours arrived. From here it was a steady paddle back to Elgol with the wind just starting kick up again as the group landed. The other group of kayakers had not long arrived back at Elgol too so after comparing notes and trying not to get in each others way the boats were unloaded. Despite the lack of any rain and only a relatively minor midge attack this turned out to be a fantastic trip, enjoyed by all. Many thanks to Alan for organising this trip, both plans A and B, and leading the group. Some members have indicated that they would like to have a shortish paddle this Tuesday with some rescue scenarios followed with some wet work ( you do not need to get wet to come along it's open to all who are happy with the distance on the night and the type of paddle it will be). I suggest that we meet at Camas Ban for 7pm where we will set off on a (11km) paddle with a twist! I envisage us being off the water by 10ish. Those keen on getting wet please dress appropiately and please bring with you some fluids, a snack and any medication that you may require. Hope to see you there......James. Ps. If you have a compass please bring it along. Evening Session 2nd June 2015. Not many turned up for a paddle on a choppy Loch Caroy. The wind seemed to peak just after 7 p.m. and made launching from the jetty with a very high tide interesting. We just paddled into the wind to the River Caroy and with the tide being so high we could paddle a short way up river until we were stopped by rocks. Returning back to the loch a few minutes later we found a stock fence that we had paddled over was now exposed by the ebbing tide. Fortunately it was not too solid and sagged as we paddled over it. The paddle back to the jetty was very easy with the wind behind us. The paddle to the Ascribs that was to be on the 7th June has now delayed to the 20th June 2015. Please let Janice know if you are interested in doing this trip. 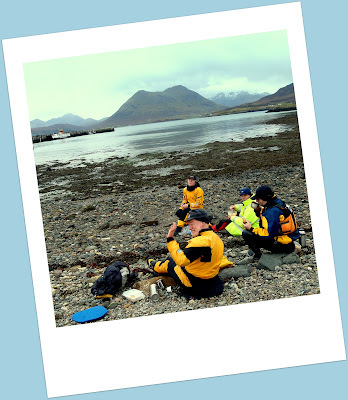 To celebrate Skyak Adventures being in existence for fifteen years, we have drawn together the coaches we have worked with over the years and pulled them to Skye for a social weekend of fun, skills development, and learning. As always, all of the coaches we have working for us are at the top of the game. Some are authors, others kayak designers and one is a world champion. There is nowhere else that you will get such a committed group of professional coaches at this level in small class sizes to ensure your learning is focused to your needs. Confirmed coaches are Gordon Brown, Oisin Hallissey, Howard Jeffs, Ivan Lawler, Mike McClure, Ken Nicol, Andy Stamp and Rowland Woollven. Check back to view coach bios. Numbers are capped strictly at fifty participants and places will be offered on first-come basis. To book your place and sessions click HERE. If you have any queries, CONTACT US. The event will be based at The Broadford Hotel using our Skyak hub too. Each individual must complete a booking form and choice of session for each day. T-shirts are also available if ordered in advance. Journeying Skills/Rescue Session Saturday 30th Camas Ban. I know this is late notice but I only have Skye's fickle weather to work with!! I am looking to run this all day session for you folks who will be attending any of the club trips that are planned for the near future ( you do not need to be attending the club trips to come along it is open to all). In the first half of the session we will cover; Paddlers Roll and Responsibilites, Paddler and Trip Leader Equipment, Group Paddling Skills, Towing, Night Paddling. After lunch we will move on to Assisted Rescues and Self Rescues. I envisage this will give us enough to be getting on with and should cover most of the day. For this session to work, and for it to go ahead, it will require a certain number of paddlers to turn up on the day, I ask that you confirm your intentions to attend to me at shamus_cornes@yahoo.co.uk by 21.00hrs on Friday evening. If we do not get enough interest for this session I may cancel it or run a club paddle in the Bracadale area instead. I intend to meet at Camas Ban at the civilised time of 10.30. Please ensure you bring with you a spare change of clothes, lunch, hot drink, a handheld compass if you have one and any medication that you may require. The afternoon session will be a wet session so please dress appropriately!!! Hope to see you there............James. 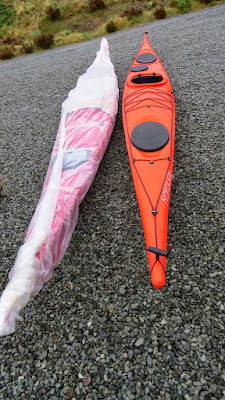 Two of the new club kayaks have arrived. Alan and Margaret called at the toy shop in Oban and collected one North Shore Atlantic and one Valley Nordkapp and transported them back to the Isle of Skye. Club members must form an orderly queue and take it in turns to try them. Thank you very much Alan and Margaret for transporting the new kayaks. Proposed Trips for June and July 2015. 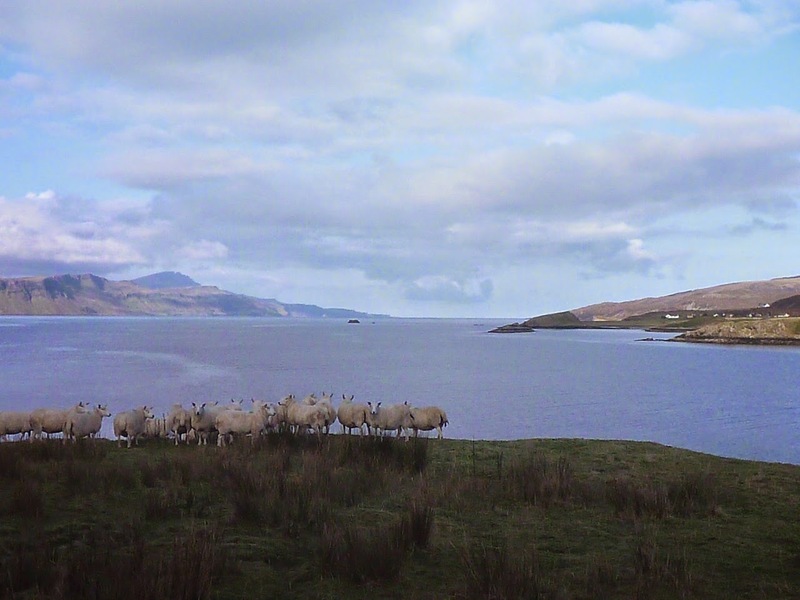 Raasay and Rona - Saturday 13 June to Monday 15 June. Day 1 Sconser to Caol Rona (via east coast), 17 miles, make camp. Day 2 day trip round Rona, 12 miles, back to camp. Day 3 break camp, return to Sconser via west coast, 15 miles. This trip is aimed at more experienced members who are comfortable with paddling a loaded kayak for the distances involved. The trip will only go ahead if conditions are forecast to be favourable. However, the are no easy escape routes on this trip and there is always the possibility that wind and sea state may become challenging. Members wanting to join the trip should therefore be confident in their ability to handle such conditions should they arise. East and North Coast of Skye (between Portree and Camus Mor (near Kilmuir). Evening of Friday 24 July to Sunday 26 July. Friday evening Camus Mor to Lub a Sgiathain 6 miles, make camp. Saturday break camp, Lub a Sgiathain to Rubha nam Brathairean 13 miles, make camp. Sunday break camp, Rubha nam Brathairean to Portree 14 miles. This trip is aimed at intermediate level members and would therefore only go ahead in conditions suitable for this level of experience. At this stage I would just like to know who is interested. I will prepare more detailed information later. Evening Session 28th April 2015. Our evening session took place at Camastianavaig on the Braes just south of Portree. The weather during the day was dismal and cold but it brightened up in the evening and we had a nice paddle in the sunshine. We had a total of ten paddlers heading out of the bay towards The Aird. We kept close to the coast, rock hopping and exploring the caves on the way. 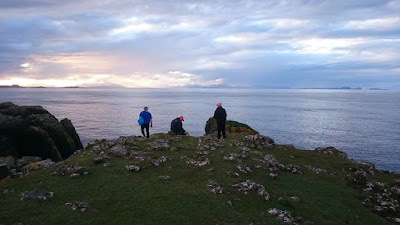 As the sun dropped behind the cliffs we made our return journey back to Camastianavaig. 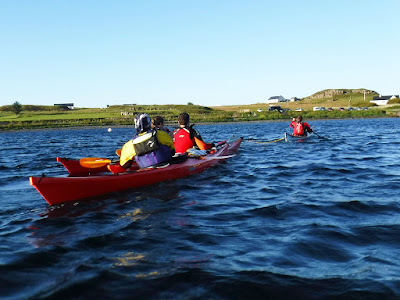 On Tuesday 22nd April 2015 we had our first evening kayak session of the year. 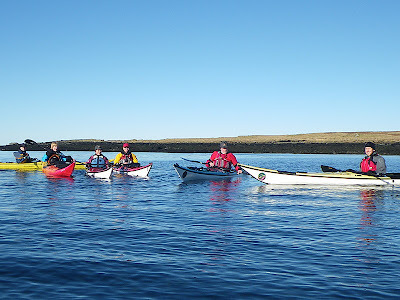 Nine club paddlers turned up, the weather was good and we enjoyed a paddle to Ose where we were surrounded by seals. We are alternating the location for the evening sessions this year. Loch Caroy will be our meeting point every other week and at other times various locations will be used to make it more interesting. On the 28th April we will be meeting at Camastianavaig. 19th April 2015 – Stein to Coral Bay via Isay. On a day of extreme tides and stunning weather the group, lead by Alan, departed Stein jetty at 10 o'clock heading across a pond-like sea for the islands of Clett, Mingay and Isay. In the company of a couple of seals the group paddled round the back of Clett before landing on Mingay to stretch the legs, explore the remains of the 1800s lime kiln, and take in the scenery. Well rested, the group headed on past the bottom of Mingey and up the side of Isay while doing their collective best to remember the details of the islands infamous history. At the top of Isay, during a game of 'name that outer isle', there was the first hint that conditions may get just a little more interesting later in the day as someone finally switched on the wave machine. Lunch was had on the tidal island of Lampay while looking across the causeway to Coral Bay, and the increasingly distant sea. The journey back to Stein was a bit more arduous as the group paddled into a tiring headwind and the wave machine was turned up a notch. The group landed back as close to the jetty as the very low tide would allow with one member of the group making a particularly graceful exit from his boat. Many thanks to Alan for planning and leading this trip. Sun 15th Mar 15 - Kilmaluag to Flodigarry and return. 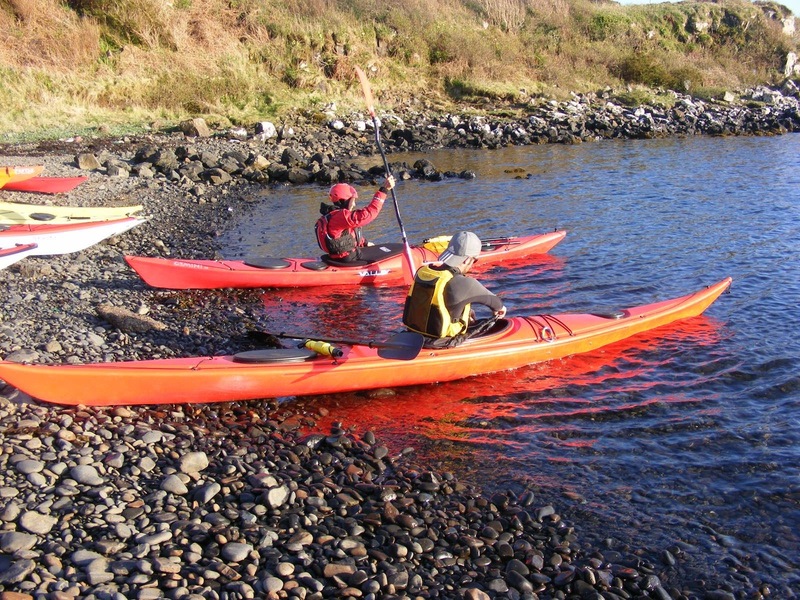 We had a good turn out for our first paddle of the new year with Alan, Andrew, Gavin, James, Malcolm, Neil, Ross and Shirley, meeting at Kilmaluag Bay. Leaving the bay we made our way down to Flodigarry enjoying the sunshine exploring the basalt coastline before making the short crossing to Flodigarry island where we stopped off for a bite to eat while basking in the sun while watching some curious seals. Following lunch we made our way up the coast of the island where there was some surf for the more adventurous paddlers before making the return trip along the coastline where James demonstrated his rolling technique while passing through one of the caves. Thanks to James for organising our first outing of the new year which was made especially enjoyable considering the fantastic weather that we were graced with. 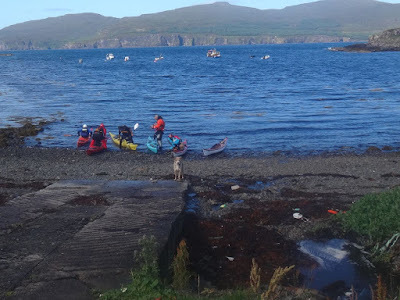 The Annual General Meeting for the North Skye Kayak Club will take place at the Tongadale Hotel, Wentworth Street, Portree at 7.30pm on 24th February 2015. All members are urged to attend otherwise they may be allocated jobs they do not wish to do! 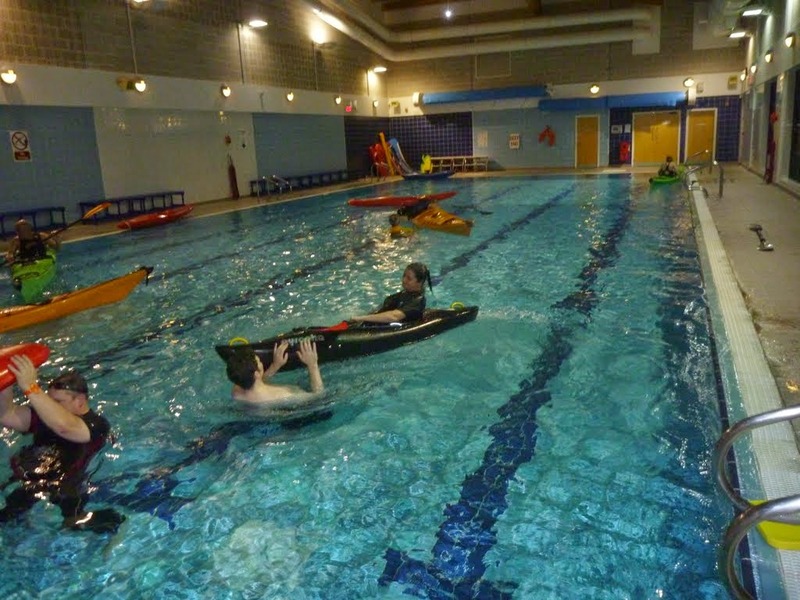 Kayak Pool Sessions, 19th January 2015. We are now settled into our pool sessions which are very well attended. The weather on Skye has even affected our indoor sessions. 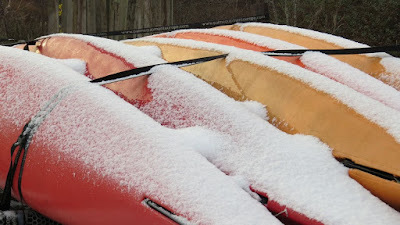 With extremely strong winds it was too dangerous to transport sea kayaks on roof bars to use on the first session on the 12th January 2015, so we only had the pool kayaks plus two white water kayaks that could be transported inside cars. Despite recent power cuts the pool was nice and warm. Everyone is using the equipment in the pool to full advantage, either learning to or practicing rolling, hand rolls, paddle float rescues, re-entry and rolls and many other things. The biggest challenge of the evening comes at the end of the session when the kayaks etc are taken out of the very warm pool, when your dripping wet, outside ready to load on the cars with temperatures of 0ºc. It’s character building! Sunday 30th November 2014 - Camas Mor, Rubha Hunish and Eilean Trodday. It was dark, drizzly then out and out raining as I headed north telling myself it would be worth it……. Only five minutes late (probably) when I arrived at Camas Mor. Rain over, brightening sky and cheery greetings from James, Alan, Ross and Neil. Before long we were on the water and heading straight across the bay for Duntulm. All the blue islands of the Outer Hebrides were strung out to our right and the little sea monster of Fladda looked beguilingly close. Tide in our favour and if there was any wind it was behind us, we motored along and were soon under the cliffs and winding our way past inlets, stacks and rocky outcrops. We rounded Rubha Hunish coming in to a small natural harbour for elevenses. Could have stayed here a while exploring on foot but once refreshed on we went. What a brilliant stretch of coastline. 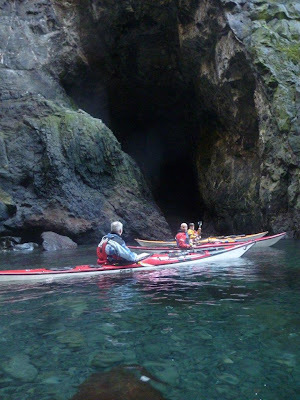 Fantastic rock faces, passages with towering cliffs on each side and windows to the open sea, narrow through caves with a sudden bright opening at the end and one passage so tight we pulled not paddled our way through with only an inch or so either side! By now the sky and sea were blue and Eilean Trodday was basking in the sun a short hop to the north. It looked a little bland from afar but as we got closer the sea became more ruffled and the cliffs appeared steeper, soon we were round the back - more cliffs, more stacks, more caves then round the last rocky corner and heading back for Skye. We called in at our morning’s harbour for refreshment again (morning coffee and afternoon tea – very civilised!). Not yet half past two so plenty of time for a leisurely paddle back. Hmm! Suddenly that none existent morning wind was in our faces, the tide was not quite so kind and it was uphill all the way. Luckily James’ challenge was for a race not a tow. Soon gave up on the racing but the extra effort it took to get back was strangely enjoyable. It was getting dark by the time we landed so a long, dark drive home…………..was it worth it? It most certainly was – Thank you James and all for a great day out. Sunday 16th November 2014 – Idrigill Point and Wiay. James, Alan, Ross and Janet gathered at Camas Ban bright and early and set out to cross a strangely calm Loch Bracadale then head up the coast for Idrigill point. Lots of interesting cliffs, arches and caves to explore on the way and (hopefully) enough froth close in under the cliffs to provide excitement for James. I was suitably impressed by our leader’s skills and enjoyed the smaller waves and swell – good enough for me! We paddled round Macloed’s Maidens and started to appraise the potential lunch stops. Though conditions were not at all bad none looked particularly smooth and inviting so we decided to head straight across for Wiay. Again, once we were out on the open water it was amazingly calm and an easy paddle across. After lunch we completed our circumnavigation of Wiay with it’s impressively tall cliffs and caves before heading back to Harlosh and the jetty at Camas Ban. A most enjoyable way to spend a Sunday. There had been reports of the sighting of a humpbacked whale between the Isle of Skye and Raasay. This prompted James to check the weather forecast and found that the 9th November 2014 would be a good day for club members to hunt for the “big fish”. James was joined by Janice, Shirley, Gavin, Ross and Ken to start the search at Camastianavaig for the creature. Looking towards Rassay we thought we could see the whale “blow” in the distance. We left Tianavaig Bay heading north towards Portree, with sea eagles soaring overhead. Paddling about 2km before going east towards Rassay we kept a constant lookout for any movements in the water. The only waves we saw were from a highspeed tour boat as we approached Rassay. We followed the coast across Holoman Bay towards Oskaig Point, stopping at a small rocky beach near Rassay House for lunch. Above the beach we had fantastic views of the Sound of Raasay but there was no sight of the whale. It was an enjoyable paddle of about 14 km on a sunny winters day. I am not sure what we would have done with the whale if we caught it. http://www.bbc.co.uk/news/uk-scotland-highlands-islands-29933606 That would make a trip very interesting. Once again James has been in negotiation with the Fingal Centre, Portree to arrange for the club to use the swimming pool for kayak pool sessions. It is a good opportunity to practice or learn rolling, self rescues and lots of other skills in a nice warm environment. Details of the cost for members to attend the sessions will be sent out by email and payment must be made in advance. The sessions will be from 19.30 to 21.00 on the following dates in 2015. January 12th, 19th & 26th. DUNVEGAN TO STEIN, 4th OCTOBER 2014. I am intending to run a short club trip this Saturday 4th if i get enough interest from members. If you are interested in attending please contact me at shamus_cornes@yahoo.co.uk . Hope to see you there....James. As the days are getting shorter, with the sun setting at about 8.30 p.m., we had our last evening session of 2014 on the 26th August. We were lucky once again to have Kevin Williams as a “guest coach”, this being the third session he has kindly given up his time to help club members improve on their kayaking skills. Once again he crammed a lot into the shorter time that we had on the water. One of the items for the session was forward paddling, something that we all take for granted. Kevin analysed exactly what we were doing during forward paddling and showed us how we could improve our stroke to paddle more efficiently. We would all like to thank Kevin for his friendly and relaxed style of coaching. Just because it’s the last evening session that does not mean that’s it for the year. There is the camping trip this weekend and I am sure this will be followed by many more day trips during the rest of the year. NSKC CAMPING TRIP FRIDAY 29 AUGUST 2014 TO SUNDAY 31 AUGUST 2014. Friday 29th meet in Portree 0930 for 1030 start. Paddle to Rubha nam Brathairean (Brothers Point) (NG525625) approximately 20km (13 miles). Saturday 30th Rubha nam Brathairean to Lub a Sgiathain (NG414762) 20km (13 miles). Sunday 31st Lub a Sgiathain to Sgeir Lang Slipway (NG369707) 11km (7 miles) Alternatively if conditions are good Lub a Sgiathain to Fladda Chuain to Sgeir Lang Slipway 18km (11 miles). The R.L.N.I. Safety Information for Kayakers. The R.L.N.I. 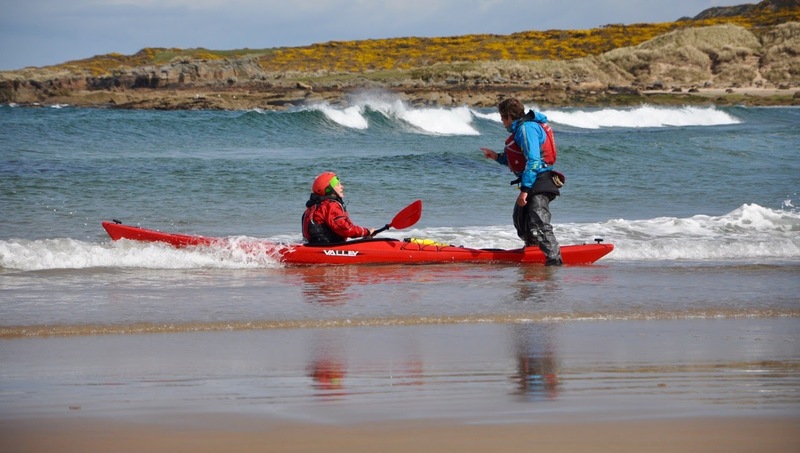 are concerned about the increasing number of sea kayakers / canoeists that are getting into difficulties on the sea so they have produced a short video, plus an information pack with kayakers in mind. STRUAN TO TALISKER BAY, 26th July 2014. This trip was aimed at newish members to give them a chance to get out of the confines of Loch Caroy/Bracadale whilst still having easy access to boat and kit at Ken's...Where were you?! At 10am six of us met (Myself, Janice, Alan, Ross, Shirley and Chris) at Struan slip on a cool cloudy and damp morning absolutely perfect after the previous weeks weather of stifiling temperatures and very little wind and with the prospect of very heavy rain as the day wore on was an added bonus! We shared the slip with a party of four kayaking ladies from the Aberdeenshire area who were preparing to go out for the weekend, thanks for the peach! We were on our way by 10.30 and making our way out of the loch when the rain started,warm rain...Bliss! We were just passing Fiskavaig Bay when we had our first encounter with a small pod of large Dolphins which were whizzing through the waters and with the occasional leap clear of the water, always great to see. landed at Talisker to a deserted beach at low water in the lovely rain. It was a short stop for refreshments etc and we were away again with a small surf launch and heading back the way we came through the cutting which brought us out at a cave which we duly investigated, the cave had a bit of a leaky roof which gave us all a chance to paddle under it's outflow. A bit of rock-hopping and we were heading back into Bracadale. Our friends the Dolphins came and gave us another visit by heading straight towards us then disappearing under the boats to re-surface well behind us. We stopped for a refreshment break on the rocky shore that has the waterfall cascading down the cliff on to the shore, Alan had a shower under the waterfall to dry off! Another hour saw us back at Struan slip and to finish the day off nicely it rained even more as we were loading up the cars.....a perfect wet cool day. Thanks to all who attended, James. 22 July 2014 Evening Session. This was a very relaxed evening session in the warm sunshine. Time was spent doing some towing practice, self rescues, cooling off and dodging the jelly fish. Click on the photos and then "Full screen" to see more photos. DAY 1. Klyeakin to Knoydart. Originally 6 people (Alan, James , Jane, Jenny, Lizzie and Shirley had signed up for the trip but unfortunately Lizzie and Jane couldn’t make it due to last minute problems with a roof rack for a new car. Saturday’s forecast was for strengthening winds in the afternoon so we were on the water at 0730 for our crossing back to Skye and South to Armadale where we stopped at the pier cafe for coffee and snacks (for 2 greedy people snack meant 2 bacon baps -- each!) At this point Jenny and Shirley decided to call it a day. This was to prove to be a wise decision in the light of Sunday’s weather, and the fact that this was the last bail out point before Elgol. Fortified by our bacon butties James and I paddled on round the point of Sleat to a brief very wet lunch spot on a boulder beach compensated for by a fine view of 2 Sea Eagles as we pulled into the beach. We arrived at Dalival to the accompaniment of some noisy seals and then spent a relaxing 14 hours in our tents in the rain and wind whilst eating, sipping wine, dozing and sleeping. The inshore forecast was for West/South West Force 4 or 5 and there were some smallish waves on the beach even in this sheltered cove. An hour and half of bouncy rather grey crossing (during which we were eyed speculatively for a few minutes by a Great Skua. -Think the film The Birds-) saw us across to Eilean na h-Airde where we stopped for a cuppa and snack and the 1010 coastguard forecast. This promised stronger winds for Monday so we decided to paddle to Loch na Cuilce for lunch then back to Elgol to end the trip. This proved to be really enjoyable (if fairly breezy) as the sky cleared with fine views of the mountains and the Small Isles. Mid afternoon saw 2 happy salt encrusted paddlers arrive at Elgol and after no time at all we had loaded the car, changed into land clothes and were sat outside the Cafe on the hill in the sunshine enjoying well earned coffee, scones and a plate of homemade biscuits. Thank you to Jenny and Shirley for your company, Lizzie and Jane for the thought, and James for the idea and the Leadership. PHOTOS OF CLUB PADDLE SUNDAY 22ND JUNE 2014. The trip started from the head of Loch Slapin(NG 561217) heading down Loch Slapin towards Rubha na h-Easgainne with a stop to visit Spar Cave and onwards around Rubha na h-Easgainne with views of the Cuillins and back. Trip distance 30km. Click on the photo, then "full screen" to see all the photos. Harris Camping Trip 28th June to 1st July 2014. DAY 1. West Loch Tarbet to Taransay Island. Well after all the fretting of will we or won't we get on the ferry it turned out to be no problem at all though we did take the precaution of loading Alan and Margaret's car with four of the seven kayaks, thanks guy's. All aboard the ferry and on our way to Harris there was only one obvious move to make the celebratory Full Breakfast, food of champions though someones breakfast was a bit light on the black pudding which turned out to be a bit of a sore point. We arrived at Harris departed the ferry and trollied over to West Loch Tarbet where we were setting off from. We paddled off into a gentle North Easterly which was to be the prevalent wind direction for most of the trip. After an hour or so we decided to stop for a cuppa and a bite to eat on a lovely small sandy shore before we went into the Sound of Taransay. Through the Sound and our landing/camping spot appeared on the shores of Taransay Island made famous for the original reality TV programme "Castaway" which then paved the way for the rest of the reality TV Crap that we now receive daily on our TV screens. Gear carried up the beach and tents pitched it was now time to sit and enjoy our fantastic natural enviroment with a small tipple to keep out the cold Northerly wind. DAY 2. Taransay Island to Rodel. With a 10am start we were all raring to cross to Toe Head and enter the Sound of Harris with it's sandy beaches, skerries and of course the remarkable Sound of Harris tides. As we cleared the shelter of Taransay the Atlantic swell started to kick in which was very gentle but never the less noticeable. As we rounded Toe Head the full effect of the swell reflecting off the cliffs was felt by and handled superbly by all paddlers. Next it was a paddle to the beautifull beach just below the ruined chapel at Rubha An Teampaill for a well earned lunch and snooze in the sun. After lunch we split into two groups one group would carry on down the coast to Rodel our intended camp site for the night and the other group would go out into the Sound to play in the tide. Both groups met up again a couple of hours later at our camp spot just beside Rodel harbour and with Rodel hotel just over the hillside a couple of us decided to pay it a visit to sample their food and beer. DAY 3. Rodel to East Loch Tarbet. 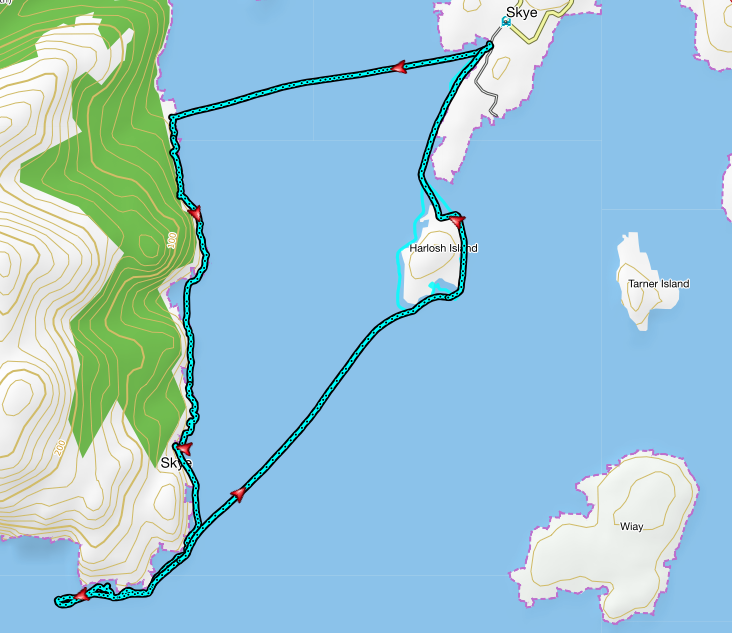 With the full East coast to do today and to find a campsite within striking distance of Tarbet and our AM ferry in the morning we were on the water for 09.30 and making our way steadily up the coast. It was glassy calm and perfect for spotting wildlife though they were rather thin on the ground today, over the course of the trip we spotted Sea Eagle, Golden Eagle, Porpoises, Otter and on the return ferry a Minke Whale. We were making good progress up the coast and with great visibility were picking out points of the Skye coast. We stopped for 2nd breakfast or was it 1st luncheon! and then continued heading North in what was proving to be a lovely day. Another stop (definitly lunch - we had a snooze!) seen us land at a unoccupied croft house with it's own shore and no visible signs of road or track access...bliss. Onwards we went evantually rounding Rubha Bhocaig and entering East Loch Tarbet, now to find a campsite for the night within easy reach of Tarbet. We had a small island in mind Rosaigh which we thought would suit our purposes for the night which it more than did. 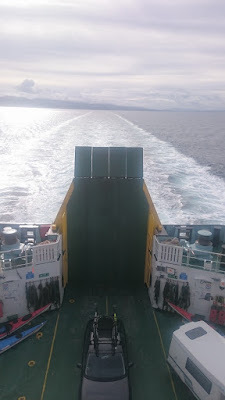 We set a course for Rosaigh island and timed our crossing of the ferry channel to coincide with Uig/Tarbet ferry crossing just in front of us and enjoyed it's wake as it passed us by. We landed on Rosaigh and found ourselves with spectacular 360 degree views of the surrounding area on what was to be a fantastic last night. The temperature was warm and the company were all on good form, a great end to a fantastic day's paddling. A special note must be given to Kevin's cookery demonstration on what you can do when camping, very impressive. Day 4 East Loch Tarbet to Tarbet. Early rise this morning 06.00 which suited some more than others! On the water for 07.30 and paddling across the last 5km towards Tarbet in glassy sunny conditions, a fantastic 5km paddle. Arrived at Tarbet slip at 08.30 and hauled the boat's out, changed into our shore clothes, fitted our trollies to the boat's and off we trundled to find out that we had arrived an hour early! Oh well there was only one thing for it, a leisurely full breakfast + cake which was delicious and rounded off a fantastic 4 day's. Boarding the ferry was easy and we spent all our time out on deck looking to spot Big Fish.....and we did a Minke Whale! Thanks to Alan, Margaret, Janice, Kevin, Gavin and Jenny for a fantastic 4 day's on and off the water looking forward to the next time.......James. Evening session at Caroy tomorrow night, 24th June 2014, meeting at 7.30. As normal, please let us know if you’re coming and need a boat etc. We’re all capable of paddling back and forth, sideways etc. but are you all confident with co-ordinating a group rescue of a fellow paddler should they capsize and how often have you practiced self-rescue in wavy conditions in the sea? Are you constantly aware of where your buddies are and could you recognise an unstable paddler in advance of a potential capsize and react accordingly? How long would you wish to be in the sea adrift from your boat if the wind suddenly blows up and nobody is watching? (as it frequently does on Skye). These are all things we should be prepared for and practice regularly so let’s focus on some tried and tested methods tomorrow. If you can, please wear a wetsuit/drysuit ready for getting wet. CLUB PADDLE SUNDAY 22ND JUNE. I am intending to run a club paddle this Sunday 22nd (weather permitting). The trip will start from the head of Loch Slapin(NG 561217). From there we will head down Loch Slapin towards Rubha na h-Easgainne with a stop to visit Spar Cave (If you have a torch bring it with you the brighter the better!) and onwards around Rubha na h-Easgainne to give us views of the Cuillins, we will then paddle back to our put-in. Trip distance 30km. I would like to meet at Loch Slapin for 09.30. I envisage this trip could be suitable for all club paddlers who are confident enough that they can paddle the distance and handle the forecasted weather conditions, if in any doubt of your ability please contact me. As per usual please ensure that you bring with you lunch, hot/cold drink, snacks, spare change of clothes and any prescribed medication that you may require. If any paddler requires club kit please liase with Ken. Hope to see you there...…James. Evening Session 10th June 2014. Five members turned up for the evening practice session and enjoyed some nice "lumpy" water on Loch Caroy and some practice rescues in the sheltered section of the loch. Click on this photo and then click on "full screen" to see more photos. BIG FISH (BASKING SHARK HUNT) CHANGE OF DAY!!! Due to the deteriorating forecast for tomorrow night and the fine forecast for tonight I am bringing this forward by 24 hrs. Know it is a bit late in the day to make changes but very much doubt if conditions would be acceptable for a paddle tomorrow evening. Still meeting at Meanish pier at 18.30. BIG FISH (BASKING SHARK) HUNT, THURSDAY 5th JUNE MEANISH PIER 18.30. I am intending to take a paddle around to Neist Point this Thursday evening, weather permitting. Usually at this time of year the Basking Sharks start to frequent the West Coast and in particular the area around Neist Point,not only Basking sharks but Minke Whales (myself and Gavin watched one for the best part of an hour last Friday evening). I would like to meet at Meanish pier for 18.30 and on the water no later than 19.00, where we will be able to use the last of the South going stream to take us around Neist. We should be back at Meanish at 10ish. Could you please let me know if you intend to come along. Please remember to bring with you a change of clothing, fluids, snack and any prescribed medication that you may require. One other point, there will possibly be no landing available so empty bladders please!! Hope to see you there.....James. Loch Bracadale to Skinidin, 30/31 May 2014. Click on these photos and then click on "full screen" to see more photos. Well the first club camping trip of the season got under way. Initially this was billed as a 3 day 2 night trip but due to the poor forecast on the 3rd day (Sunday) it was decided to shorten it by a day. With a couple of late withdrawals on the day it was just Gavin and myself standing on the beach at Camas Ban on the Friday morning.We had decided to paddle from Loch Bracadale down Skye's absolutely amazing West Coast round Neist Point, Dunvegan Head and down Loch Dunvegan to finish at Skinidin.We had choices of destinations but due to Sunday's forecast we decided this would be the best option for a 2 day trip. The sun was shining as we paddled away from Camas Ban and with a bit of a chop on the water we were questioning our decision to round McLeod's Maidens and down the West Coast but it soon flattened out and we were actually able to land at the small bay North of the Maidens for our first break of the day. Back on the water and heading North in what was to turn out to be a fantastic day's paddling, the wildlife, rock formations, arches, caves etc were all at their best. Another stop had to be made in a sandy cove that I have never seen before (possibly due to the state of the tide, low water) onwards we went enjoying every minute. Gavin spotted an Otter, the first of the day then porpoises and the bird life was superb. As we neared Lorgill Bay (our campsite for the night) we did not want the day to end so we paddled on by Lorgill for another few Km's just to extend our time on the water and boy was it worth it. I spotted something swimming towards shore, a head out of the water with what appeared to be two horns sticking up from it's head, No it was not a deer but another Otter with a large lobster in it's mouth with it claws sticking out of the water. As it neared the rocks it hauled it's self out of the water and was ready to tuck into it's dinner but at that moment it spotted us, what do I do eat my lobster dinner or swim away! It slipped into the water and that's the last we saw of it. As we paddled down the coast for a bit further then turned back we noticed the lobster still sitting on the rock and more importantly within paddle distance to us! I reached out with my paddle and the lobster grabbed onto the blade and I thought lobster for tea, but as i was bringing it towards the boat it released it's grip and slid off the blade and into the water....one very lucky lobster and one peeved off paddler! Camp made at Lorgill Bay, bellies filled (unfortunately not lobster) we decided to climb the hill to watch the sun go down behind the Hebs with a few drinks. As we sat there soaking up the view and the bevvy! Gavin noticed something in the water about 1km out to sea...it was a Minke Whale and that Minke circled around feeding for the best part of an hour, so with the sunset, Minke and the good company it was a perfect end to a great day...Oh Gavin forgot to pack his thermarest so maybe not the most perfect of ends to his day!! The morning dawned, we were up early and away to catch the last of the North going stream past Neist Point. The day was a little more overcast and a little more wind but it was at our backs for now, so we easily passed Neist Point where we lingered to take advantage of slack water under the lighthouse. Across Loch Poolteil and it was time for another leisurely break before heading around Dunvegan Head where we watched the off-shore tide racing South. Once around Dunvegan Head we were head on into the wind for the rest of the way down to Skinidin and with the wind increasing all the time it was a bit of a slog, to top it all off it was low water at Skinidin which resulted in a long carry/drag through ankle deep mud. Fantastic 2 day's paddling in what must be one of the best paddling destinations in the world....Roll on the Isle Harris. Loch Dunvegan Saturday 24th May 2014. 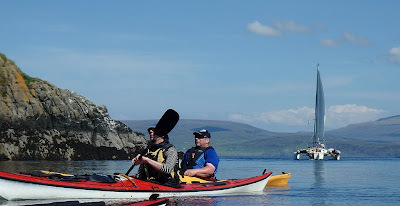 The forecast is looking very promising for the weekend and if this holds then we wondered if any of our newer members (and anyone else) would be interested in a leisurely paddle in Loch Dunvegan taking in the skerries at Skinidin and perhaps a spot of luncheon at Coral beach. We plan to make an early start of it and meet at 9 am with an anticipated return by mid-afternoon to allow us all to get on with the gardening! We’ll decide where we’re launching from later in the week. If this is of interest and you require a boat etc could you let me know by Thursday night; we may require some assistance but will let you know. p.s. Luncheon and refreshments not provided! Happy Kayakers at Kyle Rhea. I had arranged to go for a walk with friends at Kyle Rhea on Saturday 3rd May 2014 and then the club arranged a paddle on the same day, also at Kyle Rhea. As we walked down towards the otter hide we spotted four club kayakers on the opposite side of Kyle Rhea. They had been practising breaking in and out of the fast flowing water south of the ferry jetty. By watching the angle that the ferry moved across the water it was obvious there was a strong current flowing. After not seeing any otters from the otter hide we walked back and down to the ferry to arrive at the same time as Alan, James, Gavin and Neil arrived on the Kylerhea side. They had a very enjoyable paddle in the fast moving water for about four hours. We continued our journey on the ferry for a walk on the mainland while the kayakers loaded their kayaks on the cars for the trip home. Some of the photos were taken nearly a mile away on the other side of the Klye so the quality is not that great. Tuesday 29th April 2014, Evening Session. The weather was good and members were able to brush up on skills on Loch Caroy and the surrounding area. Gavin was very keen to practice his balance skills and was successful in doing a 360º rotation on his rear deck but after completion, ended up in the water. This enabled him to practice self-rescue. Click on the photo and then select "full screen" to see other pictures of the session. First Evening Session of 2014. 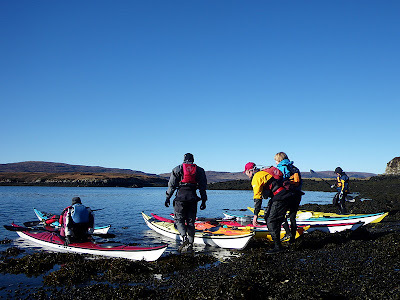 It was difficult to load the kayaks onto the car with the northeasterly wind blowing, but on the water we were sheltered most of the time by the rocky coastline. Six club members launched at Loch Caroy Jetty and we made our way along the coast to the River Ose where we were surrounded by the local seal colony, who were already in the water waiting to greet us. It was great to see them without the hassle of seal tour boats. On the return journey we were able to watch the sun setting on the horizon behind Healabhal Bheag and Healabhal Mhor. It was a pleasant way to spend an evening. Loch Brittle to Portnalong Sunday 20 April. I am arranging a paddle for Sunday 20th, Loch Brittle to Portnalong. Another stretch of magnificent West Coast with caves, arches, sea stacks, waterfalls, high cliffs and hopefully wildlife...No Frenzied water though! I am intending to meet at Loch Brittle for 09.00 do the shuttle to Portnalong and on the water for 10.15ish. This trip is possibly better suited to competent well conditioned paddlers due to trip distance (28kms) and the possible lack of landing/refreshment spots. If unsure of your ability for this trip please contact me atshamus_cornes@yahoo.co.uk could all paddlers wishing to attend please let me know in advance. Could all paddlers ensure they bring with them spare clothes, lunch, hot drink, easily available and edible snacks, fluids and any prescribed medication that they may require. Oh..... and sun cream! Hope to see you there......…James. NEIST POINT SATURDAY 19th APRIL. Cancelled due to weather forecast. I am arranging a club paddle for this Saturday "Weather Permitting". The trip will be departing from Meanish Pier (Loch Poolteil NG155505)and heading out to Neist Point where we will follow the coast down to McLeod's Maidens where we will then turn into Loch Bracadale to finish at Camas Ban (Loch Bracadale NG284413). This is a stunning section of Skye's coastline where there are waterfalls, caves,arches and sea stacks dotted along this impressive coast which forces water into a frenzy as it passes Neist Point. Due to the committment, distance (32km) and timing in paddling this stretch of coastline this trip will be more suited to competent well conditioned paddlers (please contact me at shamus_cornes@yahoo.co.uk if you are unsure of your ability for this trip). I am planing to meet at Meanish Pier at 09.00 to do the shuttle to Camas Ban and back and be ready to hit the water at 10.15ish. Please let me know by 8pm Friday if you are intending to attend. Please ensure you bring with you spare warm clothing, lunch, hot drink, plenty of fluids, plenty of easily available snacks and any prescribed medication that you may require. Hope to see you there.......James. As we seem to have a few bargains to advertise, a new FOR SALE page has been added to this web site. Should any club member wish to advertise any kayak related items for sale contact Ken. If you are in need of kayaking equipment you may also advertise your requirements and other members may be able to help you. Evening Paddling Sessions Start Again. Our outdoor sessions recommence on Tuesday, 22nd April, meeting at Caroy jetty at 7pm which should give us a couple of hours on the water: a slightly later start of 7.30pm is proposed as the season progresses. 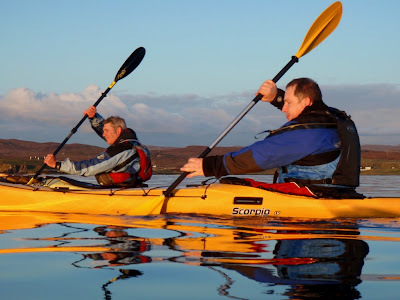 It is hoped that we will have a weekly meeting with a mixture of skills coaching for those who wish/need it and/or a short paddle in Loch Bracadale. As was the case last year, we can offer other evening venues for variety but that depends on those who are able to transport boats. As these sessions are intended to provide you with effective technique, personal safety and group awareness skills, it would be beneficial if you could come prepared for an occasional spell in the water so a wetsuit as a minimum layer of protection would be great: if you need any advice on resources then please just ask. We’re looking forward to offering a season of long weekend trips, day trips and Tuesday evening practice and hope that you will join us in our voyage of discovery. Please let Ken know in good time if you require any equipment! DUNVEGAN TO CORAL BEACH/ISAY ISLAND. Five of us met at 10am for the first (official) trip of 2014. Alan and Margaret, Jenny, Janice and James. Weather was overcast with a light SE Wind which was forecast to drop away as the day wore on and with the chance of some sunshine later on in the afternoon, though possibly as we were due to be coming off the water! After our discussion about on the water procedures and a discussion on our conduct around McLeod's seals we were ready to get going. With the SE wind at our backs we were quickly making our way up around Dun Faidart where some one spotted an Otter. In a very short time we were closing rapidly on the Coral Beach where we had thought we would have lunch but as it was only 11.45 we all eventually! agreed that it was too soon to stop for lunch but a quick brew stop was in order before continuing on towards Isay island. An hour or so later and we were back at the Coral beach now very much ready for lunch and with the spring low tide very much in evidence the Coral beach and the adjacent Lampay island were very much as one. After lunch we had a very leisurely paddle in glassy conditions back to our launch site with the sun just coming out as we were carrying the boat's up the shore!! All in all a fine short paddle in fine company, looking forward to more in the month's ahead. Your Benevolent Dictator!! Click on photo to see more and larger pictures. PROPOSED CLUB KAYAK CAMPING TRIPS. it would be helpful if you could let us know that you're interested. The dates in June would still be the proposed Harris trip. 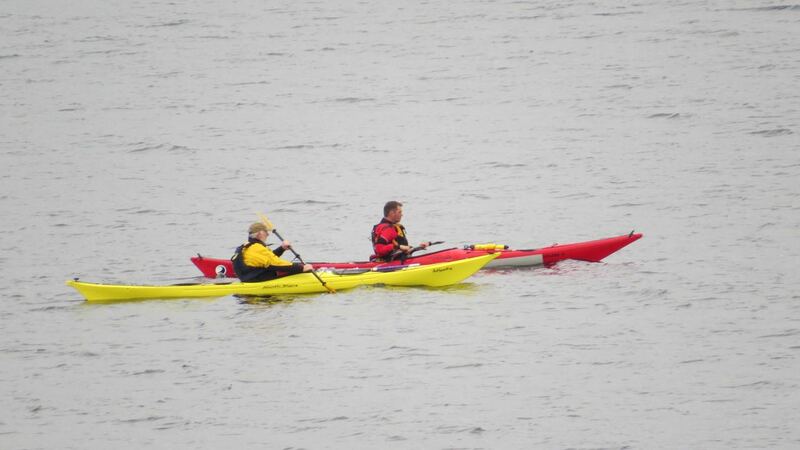 The Annual General Meeting for the North Skye Kayak Club will take place in the Caley Hotel, Wentworth Street, Portree at 7p.m. on 25th February 2014. Any one who wishes to have an item brought before the meeting must submit it in writing to the secretary not less than seven days prior to the AGM. The 2014 kayak pool sessions have got off to a good start using a mixture of pool kayaks and sea kayaks. They have been very well attended and members have had the opportunity practice rolling, support strokes and self rescue techniques. The first event in 2014 are the kayak pool sessions that start on the 13th January at 7:30pm until 9:00pm. Please do not forget to send Janice a cheque for £30 if you put your name down to take part. Paddle, Sunday 8th December 2013. James is organising a "Sheltered Outdoor session" on Sunday if anyone fancies it ?! Contact James for further details. 3* Indoor skills session on Wed 11th December 2013. We are intending to hold the first 3* indoor skills session on Wed 11th, 7 pm, at Alan and Margaret's home in Kingsburgh. These sessions will cover Tidal Planning, Navigation, Weather Forecasting, Group Awareness, Equipment, First Aid, Enviroment and Bouyage. We envisage this will not be all covered in the one evening but possibly over 2 or 3 evenings. If anyone has anything specific that they would like to cover please let us know. Could you please indicate your intentions to attend to myself and Alan. Camas Ban (Loch Bracadale) to Talisker Bay Saturday 9th November. NSKC has booked the swimming pool at Portree so that the club can have kayak pool sessions. This means members can practice paddling techniques, rolling and self rescues in pool kayaks and sea kayaks in warm conditions. The pool sessions will be in two blocks. Block one. 13th, 20th and 27th January. 10th of February 2014. Each session is 90 minutes. Block two. 17th and 24th February. 10th and 17th March 2014. Each session is 90 minutes. Each four session block will cost £30 payable in advance. water was not even cold! 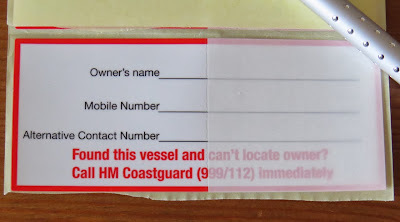 The Maritime & Coastguard Agency ask sea kayakers to put labels in their kayaks in case they go adrift or you get separated from your kayak. They are now giving away free laminated labels to help you to do this, information here. Navigation. From tidal basics to advanced course shaping this coaching session emphasises practical navigation techniques and is co-presented by Franco Ferrero, author of the definitive manual on sea kayak navigation. Rolling Clinic. A unique interactive rolling clinic in which Gordon demonstrates most common mistakes then shows how to fix them. Diagnose your own faults and teach yourself to roll. First Aid Kits. Rowland Woollven of the Wilderness Emergency Medical Services Institute advises on first aid kits for kayakers and how to deal with medical emergencies. Raasay weekend 12th and 13th October 2013. Click on above and "Full screen" to see slide show. Saturday 12th saw light winds forecast for the weekend so Alan, Gavin, James, Jenny and Neil met as arranged at Camastianavaig at 1000 for departure at 1045 for the Club’s first overnight camping trip. Local wind variation saw a good SE force 4 funnelling into the bay which gave us some pause for thought. 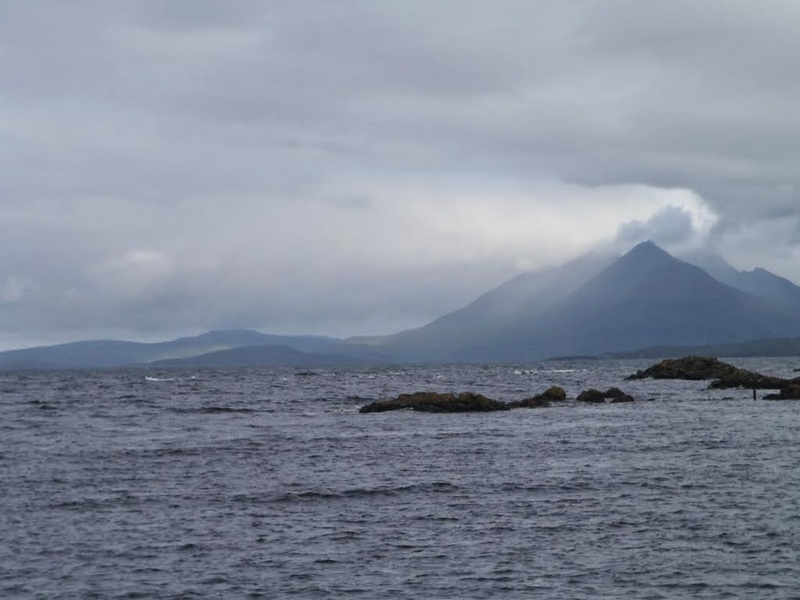 However, we judged that the west coast of Raasay would be sheltered and what wind there was would be behind us. So it proved and having crossed over we paddled along to Eilean an Inbhire for a cuppa and snack. We then paddled up the west coast in increasingly calm conditions with some rock hopping and caves stopping at Manish Point for lunch. Then it was on to the north end going outside of Eilean Fladday towards Eilean Tigh where we opted to try the gap between it and Raasay and made it through just before it dried. The afternoon and the calm sea gave us good sightings of porpoises along our way and a large group of seals on the Fladda skerries (Griane-sgeir) which we were able to pass without disturbance to the seals by keeping a good distance and paddling smooth and slow. We set up camp on Raasay just past the gap and had our food in the gathering dusk before enjoying a good beach fire (courtesy of James) with wine, beer, nibbles and blether before an early night feeling satisfied with our first day. 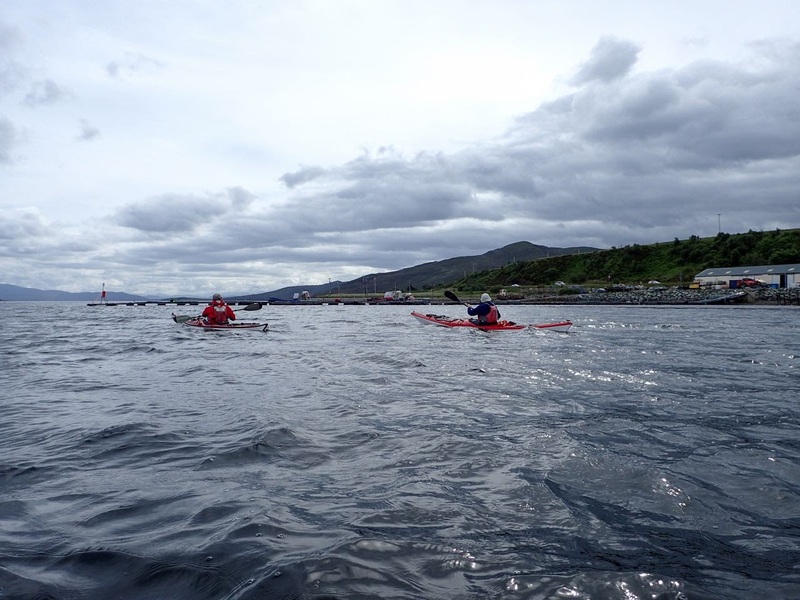 Sunday saw us up at 0700 which enabled us to leave at 0900 to start our paddle down the East coast round the South end and back to Camastianavaig. 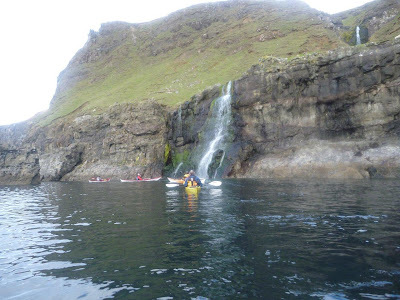 We started in calm conditions and had elevenses at Brochel after which we paddled down to the waterfall below Hallaig. As we paddled this section we began to get some smooth waves coming towards us and by the time we reached Rhuba na’ Leac we had the wind too. Around the point it was pleasantly bouncy and from here down to Eyre point there were some waves worth catching for a ride. Round Eyre point we had a late lunch and then paddled to the old Pier then across the Narrows and back to our point of departure. We had a great weekend in brilliant weather with excellent company. For which thanks. Special thanks to James for organising the trip and leading us.....Alan. 3 STAR SKILLS TRAINING SESSIONS. 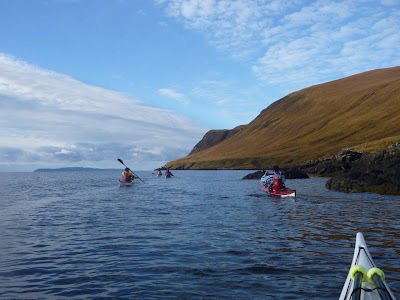 CLUB TRIP-CIRCUMNAVIGATION OF RAASAY SATURDAY 12TH SUNDAY 13TH OCTOBER. I am intending to lead a club trip to Raasay this weekend leaving on Saturday returning Sunday weather permitting, forecast at the moment is looking favourable. My intentions are to meet at Tianavaig Bay for 10.00 and be on the water 10.45. 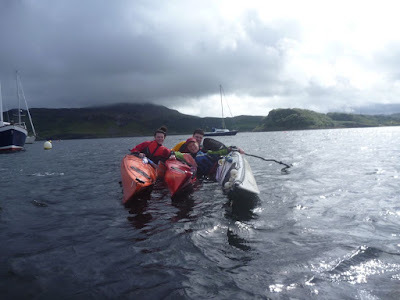 We will then paddle across to Raasay's West coast where we will make our way up to Eilean Tigh where we will be camping for the night, approximate distance 30km's. 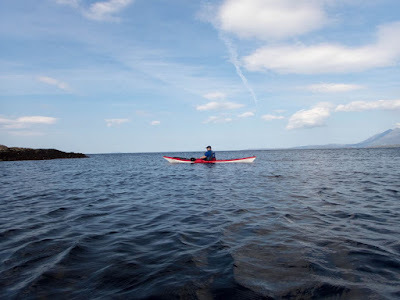 Sunday will see us paddle down the East coast of Raasay stopping for lunch en-route, hoping to be back at Tianavaig Bay for late afternoon approximate distance 35km's. This trip is better suited to competent self sufficent paddlers who are comfortable paddling the distance within a group, if you are unsure of your suitability for this trip please contact me. Could all paddlers who would like to come along please contact me atshamus_cornes@yahoo.co.uk to register your interest. Glenmore Lodge is advertising Free Qualification Courses. Quote from their advert, "If funding is a genuine barrier to gaining a qualification we now offer a number of potential sources of financial support that could in some cases mean you receive your training free. Majority of funding only available to volunteer coaches or leaders living in Scotland. This covers surf, white water, sea and open boat. Offering the full range of BCU coaching, performance, safety & CPD modules." See www.glenmorelodge.org.uk/sources-funding.asp for more information. Rubha Hunish 14th September 2013. Click on photo then click "Full size"to see other photos. coincide with slack water and take advantage of the NE going stream, we rounded the headland at 10.59 with very little noticeable tide. caves and caverns that we would be lucky enough to explore today. We then rounded Rubha na h-Asaig with the East going stream at our backs and witnessed possibly a little more tidal movement than we had at Rubha Hunish. Now heading South and into a wonderland of cave's, cavern's, stack's, arches and curious rock sculpture we paddled slowly southwards snaking in and out of various opening's and cracks in the cliff face to see what secrets lay to be discovered. on it's way! After our leisurely lunch in the sun we continued our exploration of this phenomenal piece of coast which kept on amazing us as we paddled on by, we sadly came to the end of this fascinating coastline and decided to head out to Floodigarry Island where we disturbed seals basking on the rocks between Floodigarry and Sgeir an Eireann, from here it was a paddle down by Staffin Island and on to our take out at Staffin slip. A fantastic day was had by all thanks for the great company.....James. Struan Slip to Talisker Bay Sunday 8th September. 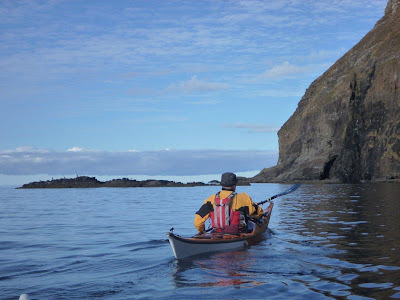 I am intending to run a club paddle this Sunday from Struan to Talisker Bay, weather permitting. If the conditions do not suit for this trip there should be options on for a paddle to Fiskavaig ? Oronsay ? Wiay ? Harlosh ? we can decide on the day! I am intending to meet at Struan for 10.00 am on the water by 10.30 am.This paddle is possibly more suited to competent paddlers, if you are unsure of your ability please contact me at shamus_cornes@yahoo.co.uk could all paddlers intending to come along please also register their interest with me. Please ensure that you bring with you; spare warm clothing, lunch, snacks, fluids (flask!) and any prescribed medication you may require. CLUB TRIP - CIRCUMNAVIGATION OF RAASAY NOW, WEATHER PERMITTING 14th - 15th SEPTEMBER 2013. This trip has been cancelled due to the weather forecast for Sunday. No doubt you have been watching the weather forecast and hoping that Saturday's forecasted wind would drop to manageable levels, don't think it is going to happen, which is a shame as Sunday's weather is looking not too bad. So unfortunately I am going to have to postpone the Raasay trip but hope to try and run it for next weekend, 14th-15th September 2013, hope you will be available ? CLUB TRIP - CIRCUMNAVIGATION OF RAASAY SATURDAY 7th SUNDAY 8th SEPTEMBER. POSTPONED now14th-15th Sept. 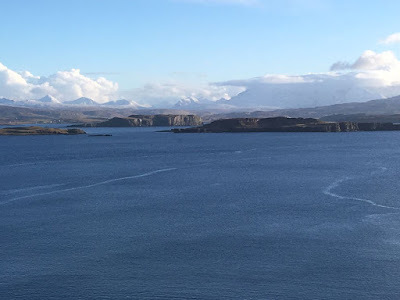 I am proposing to lead a club trip for next weekend, a circumnavigation of Raasay (weather permitting - forecast at the moment is looking favourable). until later on in the day, so I propose that we take advantage of this and paddle on up the west side of Rona to Acairseid Mor, where we could land at Rona Lodge for a leg stretch or purchase a vension burger for dinner! 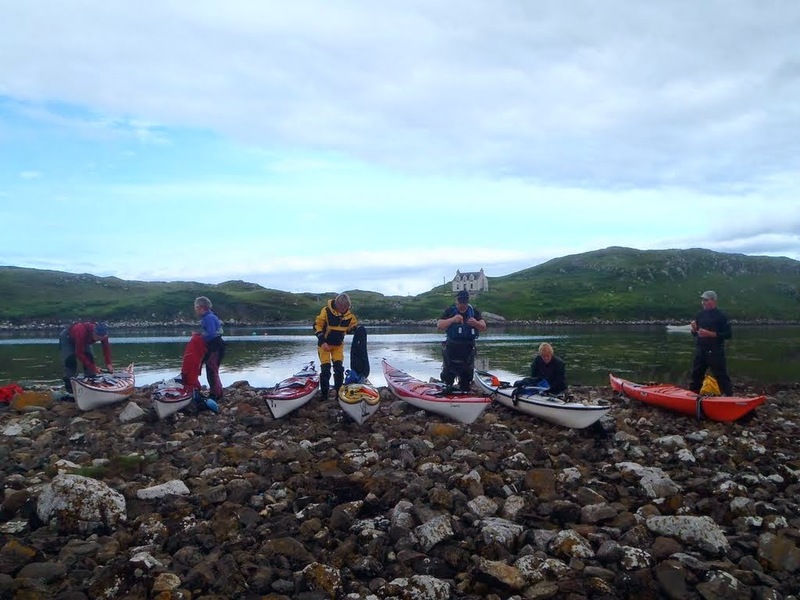 We would then paddle back to Eilean Tigh to set up camp. Approximate distance, 30km's. 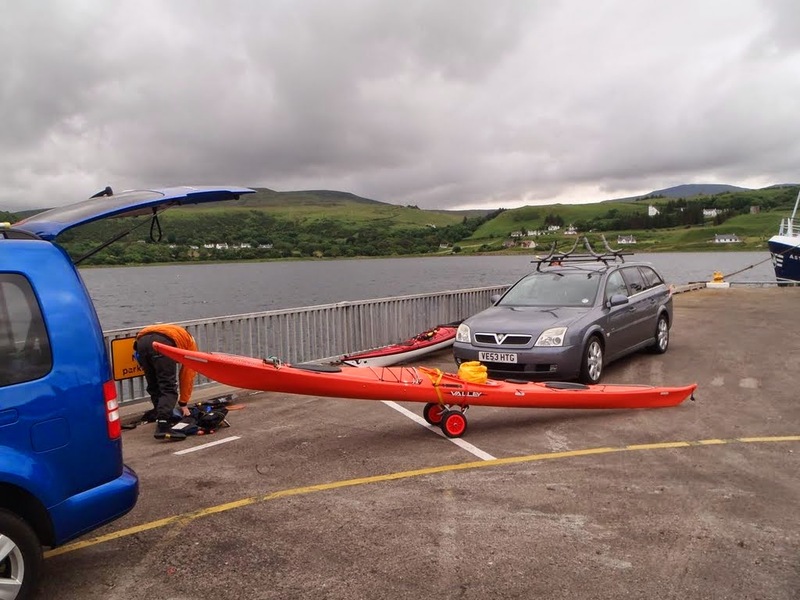 Sunday would see us break camp and be on the water for 09.30ish to take advantage of the high tide.We would then paddle down the East coast of Raasay with lunch and comfort stops en-route. Arriving back at Tianavaig Bay late afternoon. Approximate distance, 35km's. If you require any club equipment please let me know. p.s. All of the above is subject to change! Skills session at Caroy Jetty at 7.15 pm. If you would like to paddle and need equipment please let Janice and Ken as soon as possible. Stein Island Hop Wednesday 21st August. I am arranging a club evening paddle for this Wednesday 21st. The trip will be launching from Stein and heading out to the little cluster of islands just north of the Coral beach, Iosaigh Mingay and Clett. be on the water for 18.30.
also register their interest with me at the above e-mail address. Please ensure that you bring with you spare warm clothing, a snack, some fluids and any prescribed medication that you may require. Evening And Weekend Sessions, 13th & 17th August 2013.
b) stay with me in the Caroy jetty area to practice basics. I'd also like to run a wee trip on Saturday 17th for newcomers but this is also depending on the wind speed which is not looking ideal at the moment. Evening Session, Harlosh, 6th August 2013. There was a good turnout for the evening session organised and led by James this week. The water was noticeably warm; the sky was grey, but the rain held off until after dark. Cathy, Gavin, James, Janice, Jenny, Ken and Neil headed out from Caroy Jetty in a light south westerly breeze towards Harlosh Island with the choice to either land on the beautiful beach or to circumnavigate the island exploring the coastline and caves en-route. Unfortunately the wind dropped a little later to make the beach option a feast for the midges, but luckily most people had chosen to play around the rocks of the coastline and explore a few caves en-route as we enjoyed the paddle around the island sharing the coastline with a few sea birds and the odd sheep. We also observed the remains of a rather large recent cliff fall thought to be from storms earlier this year and could well imagine what the sea had been like. We then paddled back to Caroy Jetty at an earlier than usual dusk because of the thick cloud cover and in almost flat calm conditions – a reminder that the evenings are once again drawing in! Bracadale Ramble, 4th August 2010.
water paddling/rock hopping/surfing and general Fun in somewhat challenging conditions. (past and present) and make the decision yourself if this is for you. If you could contact me at shamus_cornes@yahoo.co.uk to let me know if you are intending to come along that would be great. Hope to see maybe one or two of you there! Evening Session, 31st July 2013. Evening session will take place 7.30 pm at Loch Caroy Jetty. Soay Circumnavigation from Loch Brittle. 28th July 2013 aka The Beastie Paddle! We, Janice, Neil, Gavin and myself were very happy to be paddling away from Loch Brittle beach as the Beasties on this damp, windless day were horrendous! We made our rapid beach escape and headed out of the loch following the interesting coast along Loch Brittle's south shore, paddling out of Loch Brittle we rounded Rubha an Dunain and took advantage of the height of the tide to paddle in to see the old Viking canal (possibly!) here we stopped to explore the canal, Loch na h-Aird and the Dunn that sits atop of Rubha an Dunain before beating a retreat back out to sea, Beastie attack ! 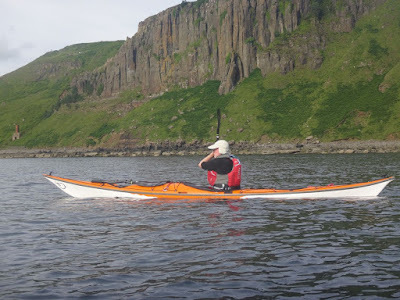 We then set our sights on the west side of Soay where we paddled along admiring the various rock structures. With stomachs groaning it was time for lunch with the opportunity to possibly have a beastie free lunch on some flat rocks. Stomachs somewhat tamed we continued around Soay passing Soay's old and only settlement at Camas Nan Gall and then with the Cuillins as a backdrop we entered the Sound of Soay where the noticable continuous westerly going stream was taken advantage of to push us along into Soay Harbour where Gavin Maxwell and Tex Geddes had their shark factory.We stopped for a short break at the factory and I had brought along some old photographs of the working factory in it's heyday with the unfortunate sharks spread out across the bay.For Gavin it had been 40 years since he had last been here with his father, memories indeed. Once again we had to move on quickly as the Beasties had tracked us down and were feasting once more. On our way back heading to Loch Brittle we spotted some porpoises enroute before turning the corner and heading back into Loch Brittle where we had a magnificent vista of the Cuillins once more. As we neared the beach we knew we would have a long carry but took advantage of the river to float the boat's as far up and as near to the cars as possible, we quickly loaded the boats and made our escape rapidly, you guessed it...... Beasties !!! A fine full day's paddle was had by all.........James. Evening Session, Loch Caroy, 23rd July 2013. It was great to be joined on our evening session by a family of four, Iain, Mairi, Campbell and Katie. Apart from Campbell who is a competent kayaker, it was a new experience for the rest of the family. 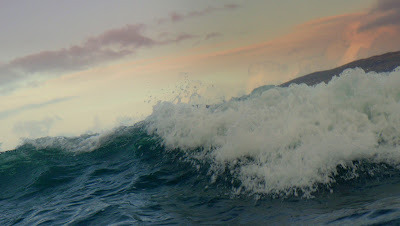 The weather was warm and the incoming tide and increasing wind generated a few waves but they all coped extremely well. At the end of the session Iain decided he would have one last trip around the moored boats parallel to the waves that were increasing in size. Leaning in the wrong direction and not having done support strokes yet resulted in a capsize. Gavin was keen to put into practice the rescue techniques he has learnt and Iain was helped back into the kayak. We all enjoyed the paddle. Thanks for the help transporting the four club kayaks, which would have been quicker if my keys had not been lost. SKINIDIN-CORAL BEACH-ISAY ISLAND-ARDMORE POINT-STEIN, 14th July 2013. I arrived at Stein at 10am where I met Gavin and admired his new boat a Northshore Ocean, he was understandably keen to get on the water with it so we raced back to Skinidin where I had left my boat earlier and quickly prepared for the water. We were on the water and paddling through the skerries at Skinidin for 11ish being followed by the usual possee of curious Skinidin seals with a lot of pups on show. Weather was forecasted to be SW 4/5 and it did not let us down,more on that later. As we made our way out across Loch Dunvegan to Dun Faidart with the wind behind us it was not long before we were making our way up the coast towards the Coral beach, we took advantage of the height of the tide to paddle into the man made fish trap and quickly made our way out before we were trapped ourselves! 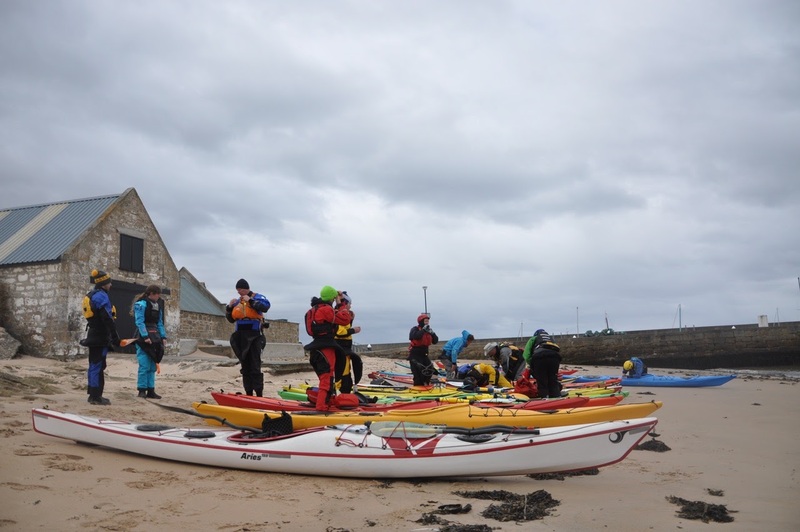 As we paddled by the Coral beach and up the west side of Isay the sea state was increasing as was expected due to our more exposed position.We nipped into the east side of Isay for some shelter and for some much needed lunch before deciding to continue across to Ardmore point. We arrived at Ardmore point rapidly and continued up to the double arch (Rogheadh) where I had a quick run through the arch and back while Gavin was getting to grips with his new boat in what was to be challenging water for him.We decided due to the increasing wind and sea state that would be enough of Ardmore point for one day. As we were making our way around into Ardmore bay Gavin missed a brace and ended up out of his boat and in the water, I came across to offer assistance but it became apparent that it would be easier for Gavin to stand up and walk him and his boat ashore! Off we went again with the increasing wind now coming across our starboard bows,we decided to stick close to shore on our return back to Stein as the wind was now blowing at the top end of F5. Gavin was a couple of boat lengths in front of me when a wave caught him out and he was in the drink again, this time he was put back into his boat by me and warned if it happens again I would be taking photos of him in the water with his lovely new boat and plastering them over the web! This seemed to do the trick as he paddled back to Stein with a very determind look across his face, well done Gavin. All in all a good day out in some testing conditions. out to the little cluster of islands just north of the Coral beach, Iosaigh, Mingay and Clett with a short stop on Iosaigh island. Well the weather is looking quite horrid for Tuesday night but Wed evening looks much better so I plan to be at Caroy although I can't be there until 7.30pm. If anyone would like to come along then please let us know if you need gear. If the forecast changes then we can too! Evening Paddle, 20th June 2013. The next club evening session will be on Thursday 20th June at Caroy. The aim is to continue working through the syllabus that you started on last week, honing and discovering new techniques. If you can be there for 7pm that would be great. Please let Ken and myself know what equipment you will need by Tuesday night so we can get organised and of course if you can manage to collect a boat etc from Ken's that would be of tremendous help. Can I just remind everyone that equipment hire is £5 for the evening and £20 for a full day trip. Dunvegan Head, 16th June 2013. I am arranging a club paddle for this Sunday, weather dependent; Loch Poolteil to Skinidin. 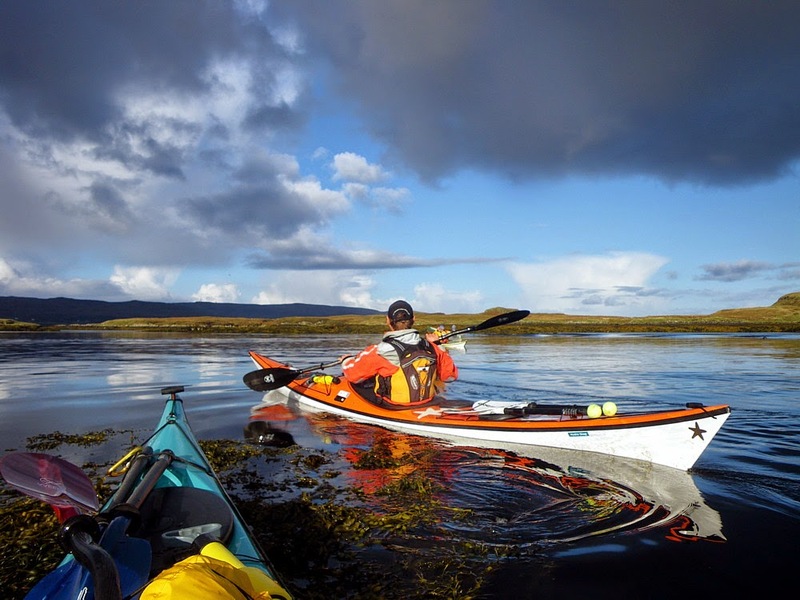 This paddle of approximately 20km will involve rounding one of Skye's prominent headlands, Dunvegan Head. Paddlers interested in this trip should in the first instance contact myself shamus_cornes@yahoo.co.uk to register your interest. If unsure of your suitability for this trip contact me. Planning to meet at Meanish Pier (Loch Poolteil) for 09.30 to do shuttle of cars etc to Skinidin hopefully on the water by 10.30. Please ensure you bring with you spare warm clothing, food, plenty of fluids and any prescribed medication that you may require. Ascrib Islands, Sunday 9th June 2013. We had six paddlers: James, myself, Neil and Gavin together with John and Lis from SSLKC. We set off in flat calm conditions and it would have been extremely hot but there was a cooling north breeze against us. 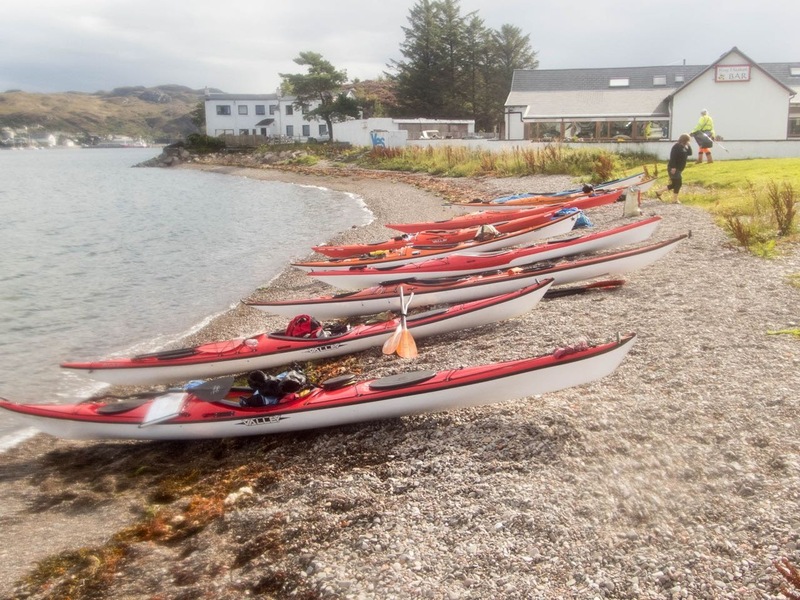 A good stretch and first luncheon was partaken on the beach at Loch Losait followed by a 4K paddle across to the Ascrib islands where we were met by the caretaker and friends who made us most welcome. We "roasted" for an hour or so then the same breeze gave us a little assistance on the way home. We were all slightly ravenous after this 30K approx paddle but very happy indeed. Thursday 6th June 2013, Evening Paddle. We're planning an evening on the water at Caroy this Thursday, 6th, meet at 7.15pm to practice some skills so a wet suit would be a good idea if you have one. If not, then there are plenty of other things we can try around the jetty area. Please let us know by Wednesday night if you're planning to attend on Thursday and what equipment you'll need. Short Evening Paddle 30th May 2013. Usual precautions; change of clothes, hot drink, snack, prescribed medication ? bring it with you if you think you may need it. Hope to see some of you there....I have ordered the sun ! Tianavaig Bay to Braes Beach, Tuesday 21st May 2013. 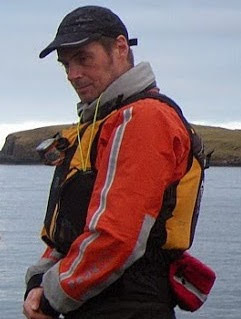 James is arranging a club paddle on Tuesday evening from Tianavaig Bay to Braes Beach, weather dependant. This is a short paddle of about 10k suitable for most club paddlers. If unsure of your suitability for this trip contact James. Looking to meet at 7 pm (or earlier?) and on the water for 7.30 pm. If you wish to attend contact James at shamus_cornes@yahoo.co.uk. Its a short paddle but the water is still very cold, so usual precautions; change of clothes, hot drink, snack and prescribed medication if required. 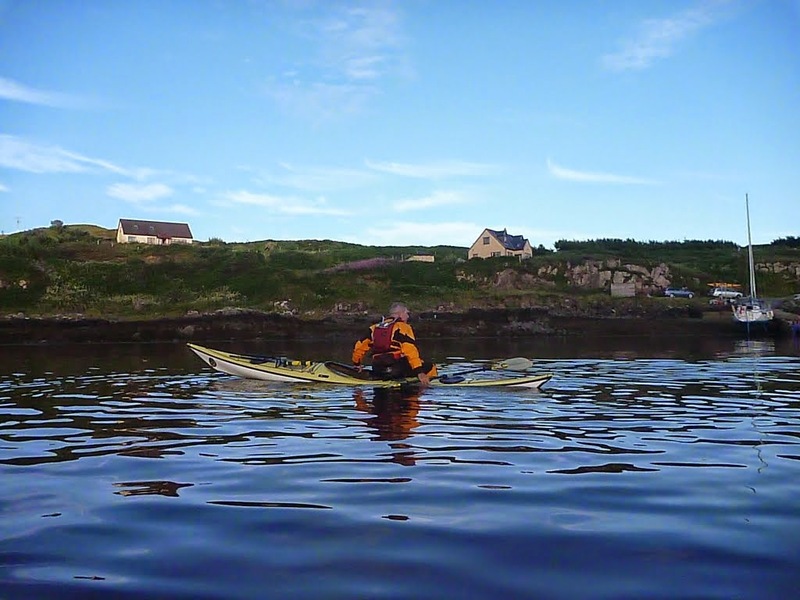 Evening Paddle to Harlosh, Thursday 16th May 2013. We planned to have the evening session on Tuesday the 14th but we had to postpone it until Thursday the 16th because of the blustery weather. So we paddled in glorious evening sunshine and daylight until after 10 o’clock. The paddle was from Loch Caroy Jetty to Harlosh Island and back. It was Gavin’s first trip on open water after enjoying the kayak pool sessions earlier in the year. It looked as though he had paddled for years and he enjoyed the experience. On arrival on the beach James spotted an oar that had been washed up with the tide and it became his pretend Greenland paddle for part of the return journey. Janice also showed us a movie on her camera of a trip she did through Kyle Rhea in very rough conditions, with Gordon Brown. On our return trip James changed his headgear which was a sign that he was about to get very wet. He did a few rolls, got out of his cockpit and rotated through 360º, jumped in the water and climbed back in. He capsized again so that Janice could demonstrate a rescue for Gavin’s benefit. He also did a bit of C1 paddling with his new “Greenland paddle”. I can see the advantages of the electric pump he has fitted to his kayak. We got back to the Jetty at about 10 o’clock after a very enjoyable paddle. It's time we all got on the water again and the plan is to start the regular fortnightly sessions from Caroy jetty on Tuesday, 14th May at 7.00 pm. We can practice some sheltered water techniques and depending on the weather we may manage a paddle out of the loch. If you plan to come along, could you please let me know by Monday what kit you require so we can organise everything in time. We hope to have something happening mid-week for beginners/improvers throughout the summer plus full day adventures for all at weekends on a regular basis. We look forward to seeing you all and if you have any questions then please do not hesitate to ask. I am sure that all members of the club would like to congratulate James on his success in obtaining the 4* leader award. Well done James, you deserve it! Four "J"s on Easter Sunday, Loch Bracadale. The four "J"s, James, Janice, Jenny and Janet appeared at Camas Ban for an Easter Sunday paddle. Originally this was to be a paddle to Macleod's Maidens but once again due to the conditions it was looking very doubtful that we would be able to make it that far. We decided to cross over to the west side of Bracadale and make our way up towards Idrigill Point, we made it as far as Brandarsaig Bay in fairly lumpy but very manageable enjoyable conditions. On reaching Brandarsaig Bay we decided that this would be as far as we would comfortably get today, though the wind was forecasted to be a south easterly the wind and waves were coming right in to the loch, a south westerly. We landed at Brandarsaig Bay for a short 1st luncheon and then launching through some surf we headed across to Harlosh Island's west side to investigate the caves, from a distance ! From there it was around to Harlosh Island's sandy beach for 2nd luncheon, stomach's full and bladders emptied, we decided to head out to Tarner island where we paddled around Tarner's choppy south east end into the relative calm of it's protected east side. Out again and once more into the chop saw us heading back towards Harlosh Point and a leisurely paddle back to Camas Ban. An enjoyable days paddle in nice company. On the 23rd March 2013 the Highland Council Rangers and Surfers Against Sewage organized a beach clean up at Loch Caroy. Along with other members of the community who gave their time, four members of the North Skye Kayak Club assisted in the beach clean up. The southwesterly wind blows flotsam and jetsam into the loch and it gets washed up at the head of the loch and spoils a very attractive area. There was an assortment of rubbish which included items from the fishing industry, crisp packets, plastic bottles, plastic in every shape and form and a very large number of spent shot gun cartridges. One wonders how far some of these non-biodegradable items have travelled to arrive on our shores. We were able to fill a large skip plus lots of bags that would not fit in the skip. Dunvegan to Stein 24th February 2013. Due to the combination of forecasted weather, distance, air temp, and group abilities it was decided to postpone our planned trip to McLeod's Maidens and replace it with a paddle from Dunvegan to Stein. Seven paddlers James, Alan, Margaret, Jenny, Janet, Neil and NSKC clubs newest member Andrew assembled at Dunvegan layby at 10am, shuttle done we were ready to hit the water at 11am on what was turning out to be a glorious winters day. We headed out through the skerries in the company of dozens of curious (MacLeod's!) seals who must of thought the tourist season had arrived early. This made for a very enjoyable start to our paddle to Stein. We headed out and paddled along the coast, being low water we had a great view of the many crustaceans that cling to the rocks around this area and many a close up photo was taken. 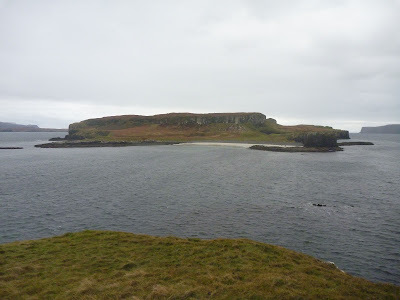 As we rounded Faidhairt we could see that we would be unable to pass through the gap between the Coral Beach and Lampay island so we set a course to head around the outside of Lampay where we spotted a sea eagle just to the south end of Isay island. We landed on Isay for lunch and sat on the kelp shore enjoying the views out to Dunvegan Head and the Outer isles with two porpoises in view in the distance. After lunch we paddled around Isay where we disturbed a flock of Greylag ? geese who took flight, a magnificent sight. We paddled between Isay and Mingay islands where we viewed the abandoned settlement and pondered on how life must of been like for the hardy inhabitants. From here we paddled across to Rubha Nam Both where some of us took the opportunity, for a short time to practice towing in these fine conditions. We then made our final crossing of the day across Loch Bay to our landing spot at Stein. All in all a great winters paddle with great company in what turned out to be a very sunny day. Thanks to all for attending and see you all on the water soon. The AGM took place on the 25th February 2013 and was very well attended by members. The business part of the meeting did not take too long, the main item dealt with were changes to the management committee. Ken Reynolds stood down as Chairman and was replaced by Alan Jones who then took over for the remainder of the business. John Allan did not wish to remain on the committee and he was replaced by Jenny Till. At the end of business Ken was presented with a card and wine for time spent as Chairman in the first three years of the club. After refreshments we all enjoyed a talk and “slide show” presented by James Cornes and Alan Jones about their “Skye Circumnavigation” or “Around Skye On Perspiration”. It was a journey of 243 km and took nine days, two of those days being storm bound resulting in one of their tents being destroyed by the wind. Wild life that they saw included porpoises, great skua, dolphins, a basking shark, puffins and a minke whale. It was a very entertaining presentation and greatly enjoyed by all. Jenny Till, James Cornes, Alasdair Galbraith, Stephen Moran and Ken Reynolds. We had another successful pool session on 21st January 2013. We were privileged to have Gordon Brown of Skyak Adventures drop in and see us. 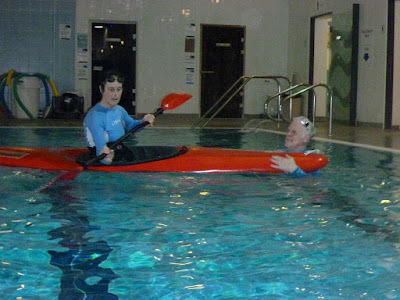 Gordon helped club members in the pool, giving advice on basic paddling, support stokes and the recovery of an unconscious/injured paddler back into their kayak. Thank you Gordon your support is appreciated. Loch Coruisk 2nd December 2012. 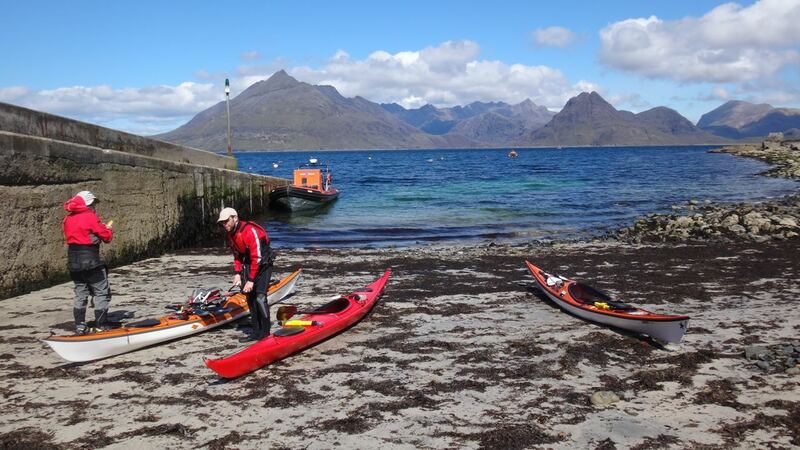 Arrangements were made mid-week for a paddle into the heart of the Cuillins, Loch Coruisk. Initial interest in the trip was healthy for the time of year but as the day drew closer numbers were dropping until on the morning of the 3rd Dec there were two hardy paddlers standing on the sandy beach at Elgol Harbour paddles in hand staring into the snow covered tops of the Cuillin ridge. The forecast was for light SE winds which would aid us into the heart of the Cuillins. We, Jenny and myself paddled along the coast to Rubh na h-Airgh Baine where we altered course to cross to Rubha Ban where we hugged the coast down to the "so called" Bad Step where we lingered for photo's and to take in the Cuillins in silence. We then headed around into Loch na Cuilce where we were escorted to our landing site by a possee of curious tourist starved seals. On landing we made our way to our lunch site where we enjoyed the reflections of the hills on the mirror like surface of Loch Coruisk before exploring further up the loch then heading back to our boats. On our paddle out from Loch na Cuilce a large sea eagle was spotted soaring around Coire Baeg which then decended lower and lower to check out the two intruders who were by now leaving his domain. A brisk paddle back to Elgol beach, which kept the body temperature up on what was a cold but very rewarding paddle. 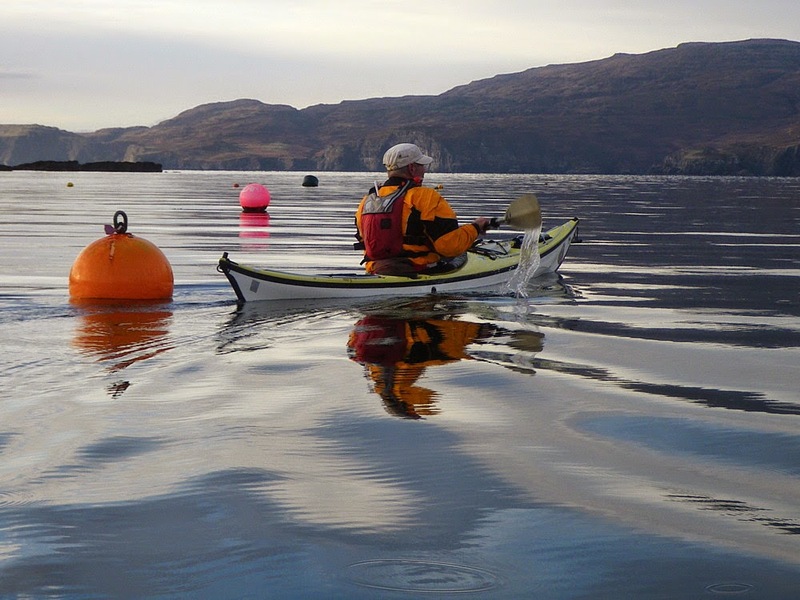 Paddle from Tianavaig Bay 11 November 2012. Sunday was forecast to be a bit windy with some showers but ever optimistic a meet was arranged with the intention of making the best of what the day had to offer, taking advantage of the relatively sheltered location if need be. The group were Hayley, Janice, Neil, Rob and I. We met at the civilised hour of 1030 at low water and were ready to depart shortly before 1100. At Rob’s instigation we observed 2 minutes silence for Remembrance on the water. I for one found it very sobering to be doing so in such a tranquil and beautiful location realising how lucky we were to be there. The conditions were fairly benign so we decided to cross to Raasay in a gentle northerly swell heading for Holoman Island where we found some entertaining rock hops nearby which everyone tried (successfully!). After exhausting all the possible gaps we paddled on to the new pier for a well earned lunch. 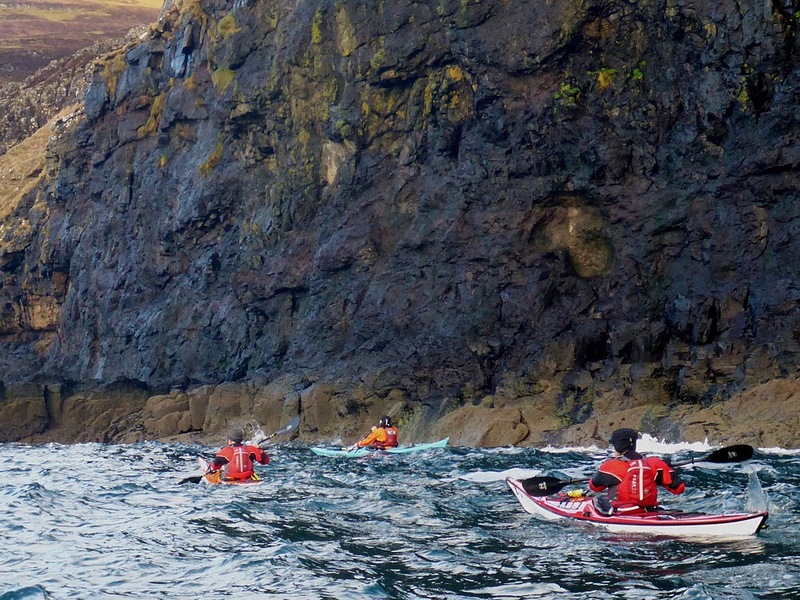 We then crossed the narrows to the headland cliffs and caves and began our paddle back toward Tianavaig Bay. By this time the tide was rising nicely and there was still a small swell running so we progressed slowly taking in as many of the rock hopping opportunities as we could without risking too much damage to people or kayaks. At one point just before Rubha Buidhe the bigger sets were breaking over some reefs which enclose a small bay so we stayed here for a while playing with the waves. I was alongside Janice when one of the bigger waves hit us in the face but she kept her balance (and her hat) with one hand on the paddle and the other on her hat! Neil also put in some fine instinctive bracing strokes to stay upright when some of the bigger waves hit. Eventually with the day drawing on we got back to the Bay where Hayley did a stylish roll to end the day but no one else braved the cold! All in all a fine day out with lots of rock hopping fun. Once again thank you to all for your company, hope you enjoyed it and hope to see you on the water again soon. Paddle from Loch Brittle to Portnalong 20 October 2012. Saturday was forecast to be fine with light wind and calm seas so it was with high hopes of a good day along some of the finest sea cliffs on Skye that the group met at Glen Brittle at 0930. The group were Rob, Hayley, James, Margaret, Neil and I plus Mary our guest from the South Skye club. After unloading boats and gear the 5 drivers departed to drop 4 cars at Portnalong leaving Hayley and Margaret to carry the boats to the waters’ edge whilst we were away. On arriving back we got on the water just before 1100. 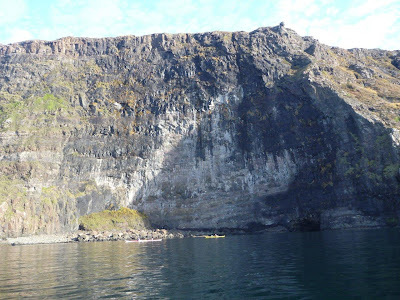 As hoped we found the conditions ideal for a relaxed paddle close into the cliffs enjoying the opportunity for rock hopping, cave exploration and wildlife, seeing otters in Loch Brittle and a golden eagle above the cliffs. Thank you to all for great company, hope you enjoyed it and hope to see you on the water again soon. Alan.